This was TRULY a trip of a lifetime. 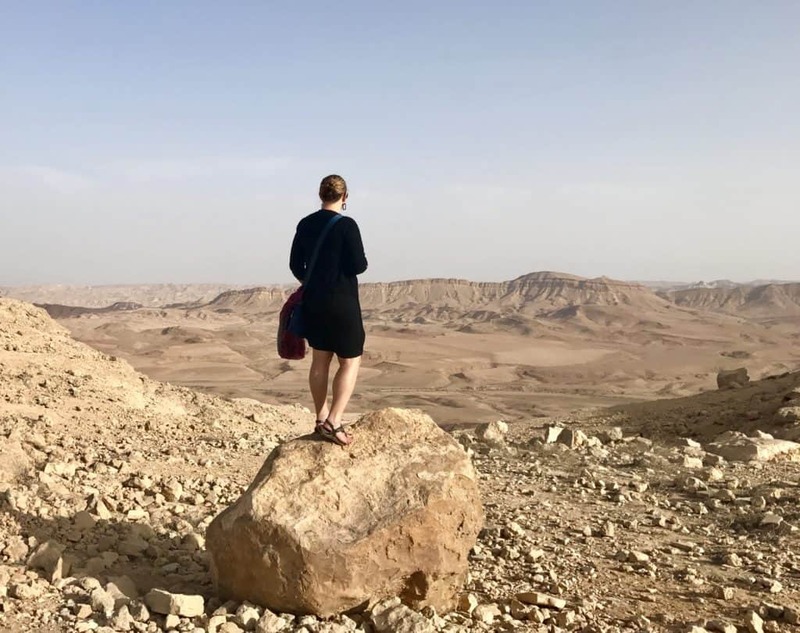 The week I spent in Israel and Jordan blew my mind in so many ways. But planning the trip also took a ton of work—figuring out where we wanted to visit, narrowing down based on feasibility, figuring out the logistics of holiday closures, and trying to pack everything in. 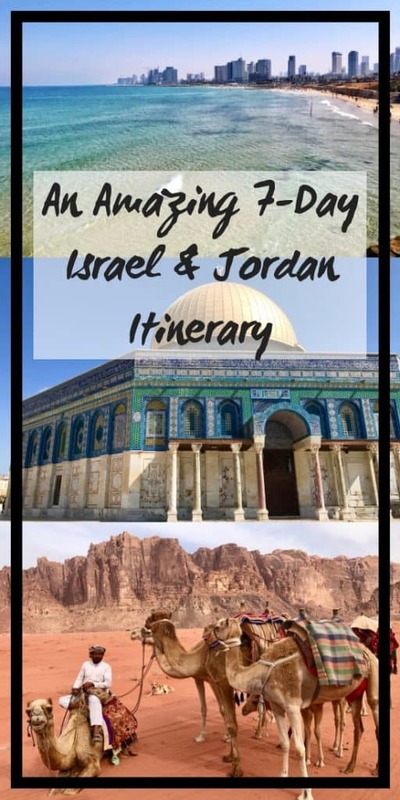 So if you’re looking to visit this amazing part of the world, I’ve done the legwork for you and laid out all the info you need to know to plan the best 7-day Israel and Jordan itinerary. 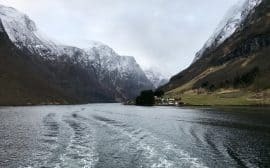 While traveling in this area of the world is incredibly rewarding, there are some logistical and cultural things you should be aware of that will help you get the best itinerary. For instance, our trip planning was complicated by the fact that we’d not only be in Israel over a sabbath, but also over Independence Day (May 1) and I really wanted to do Petra by Night (which only runs 3 days a week), so there were lots of logistical considerations—what would be open on the national holiday, if public transportation would be available, etc. I had a lot of help from my friends Steven and Danielle, who were living in Tel Aviv at the time. TripAdvisor was super helpful as well, and I read a ton of different blog posts. Make sure you check calendars for Jewish holy days, national holidays, and (especially in Jordan), Muslim holy days as well. Ensure you read up on various cultural aspects, including hospitality, eye contact, greetings, gender dynamics, religion differences, and more. This is true of pretty much anywhere you visit, but I’ve found particularly critical in the Middle East. Israel is a country that’s only the size of the state of New Jersey in the United States. I don’t know a good comparison for Europeans, but it’s basically only a little bigger than Sicily. But despite its small size, it is absolutely fascinating—boasting thousands of years of history and culture, as well as one of the most tech- and entrepreneur-focused modern countries. And the great thing about its size is that you can see and do SO much in a short time. They don’t stamp your passport when you fly in and out of Israel anymore, but instead give you a paper that you need to keep in your passport that functions as your entrance stamp. DO NOT LOSE THIS!!! However, if you cross the border into Jordan (or, I assume, any other countries) by foot or bus you will get a Jordanian stamp at the border (and sometimes the Israeli side will stamp too), so it’s easy for any other countries to know you were in Israel. If this is an issue for you, like if you plan to travel to lots of different Middle Eastern countries (who can be jerks and refuse entry to someone who’s previously visited Israel), you should plan to only fly in and out of Israel. 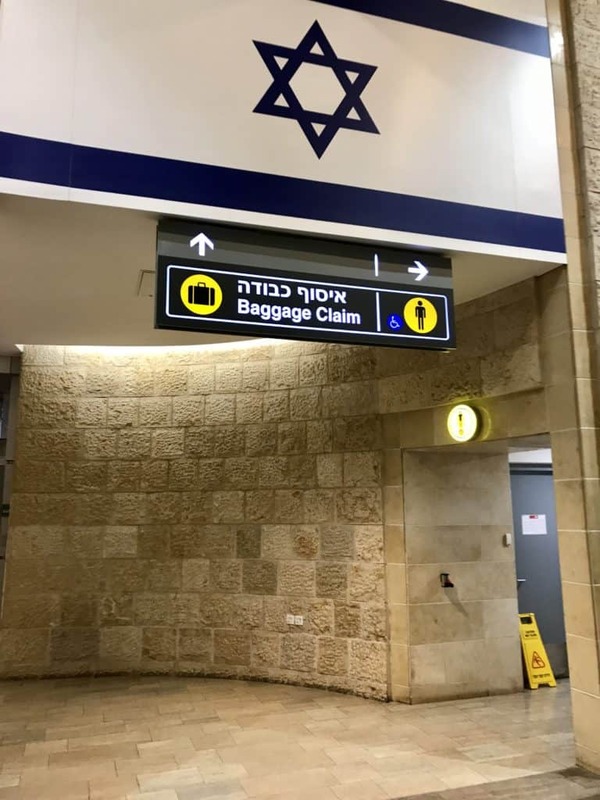 Our experience at the Tel Aviv airport was totally normal, but I have heard lots of people say that the security interview both entering and leaving Israel at the airport can be grueling and lengthy. Best to be prepared for anything, and always arrive at the Tel Aviv airport at least 3 hours before your flight. If you do happen to end up with a long security interview, stay calm and just say as little as possible. Answer the questions simply and don’t feel bad playing “dumb tourist”. They’re not hard questions…things like why you’re visiting, if you know anyone in Israel, if you speak Hebrew, etc. But a good (life) rule is just to answer briefly and not offer up tons of extra information. You can pay with a credit card almost everywhere, and certainly in most hostels and hotels. 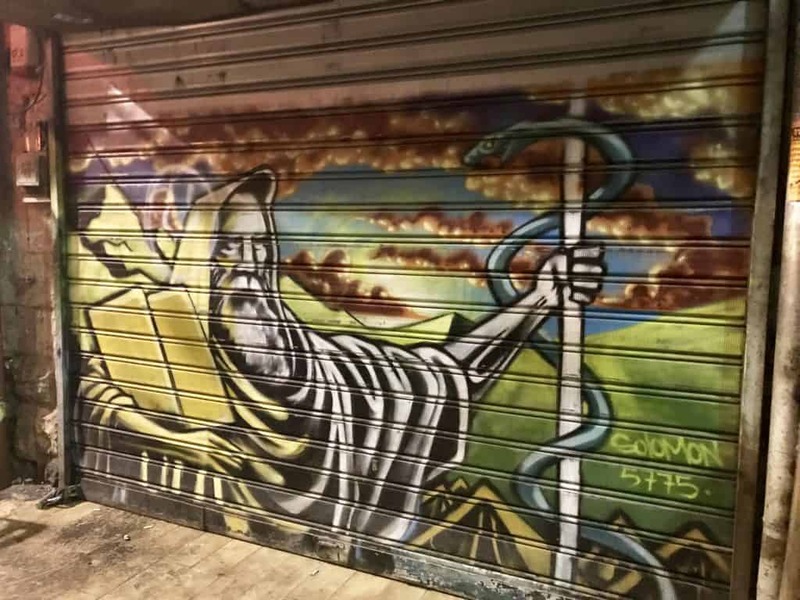 It’s still good to have cash though, and ATMs are widely available; be aware that some of them (especially those in stores) charge a commission of up to 7 shekels. It happened to me once that the ATM only took Mastercards (and my bank card is a Visa). An easy way to get to and from the Tel Aviv airport (which is basically halfway between Tel Aviv and Jerusalem) is the Nesher Shuttle, which runs 24/7 every day of the year except Yom Kippur. These are 10-seater vans or minibuses, and they will drop you off at your hotel (or outside the Old City in Jerusalem, since no vehicles are allowed in). You can get the shuttle from the airport easily, and then your hotels can help you book the shuttle back to the airport. I believe it’s about 64 NIS or around $20 USD (at the time we went). Think of this kind of like Uber Pool, so they’ll be picking up and dropping off several people, which will add a bit of time to your ride. There are bus options as well, and of course you could take a taxi (about $40 USD to Tel Aviv). If you’re taking a taxi from the airport, make sure you go to the official taxi line and don’t go with anyone who just approaches you in or outside the airport. If you’re going anywhere except Tel Aviv and Jerusalem, you definitely should consider renting a car in Israel. 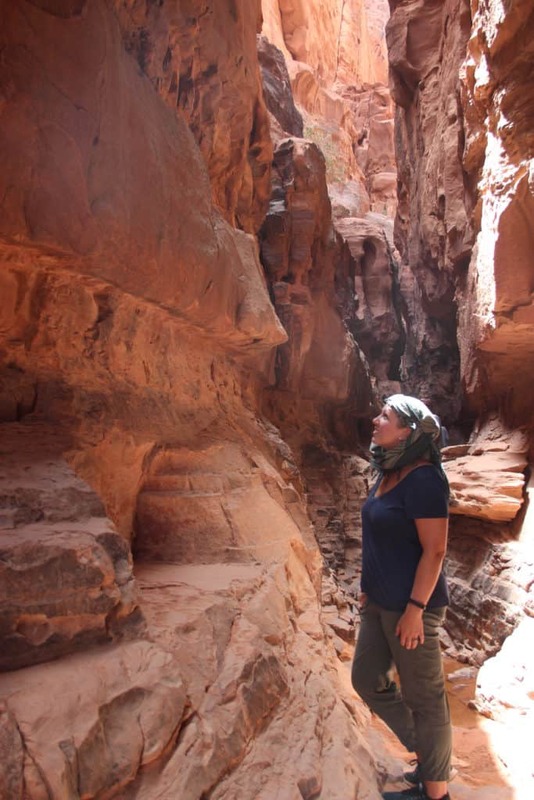 Jordan’s rose-colored deserts, undulating and cave-ridden cliffs, black starry nights, and hot, sweet tea captivated me. 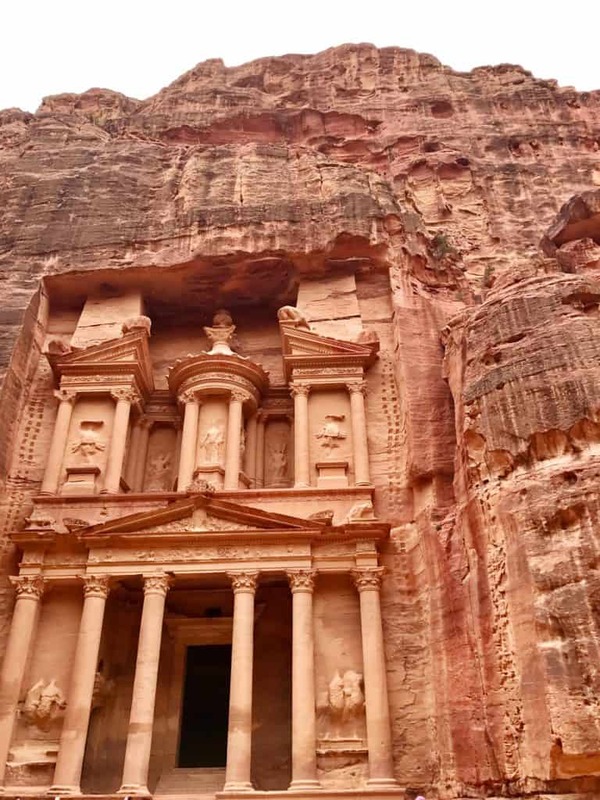 From the quiet hospitality of the Bedouins to sandboarding down desert dunes to staring at the intricate carvings of Petra, this country is absolutely amazing! It’s a cash economy! There’s an ATM in Aqaba, so the first thing we did was ask the taxi driver to take us to the ATM (it’s in his best interest, since that’s how he’ll get paid). You might get lucky and get your credit card to work somewhere, but you should assume that you’ll have to use cash for everything—housing, tours, Petra tickets, taxi, bus, food. Use an ATM any time you find one! 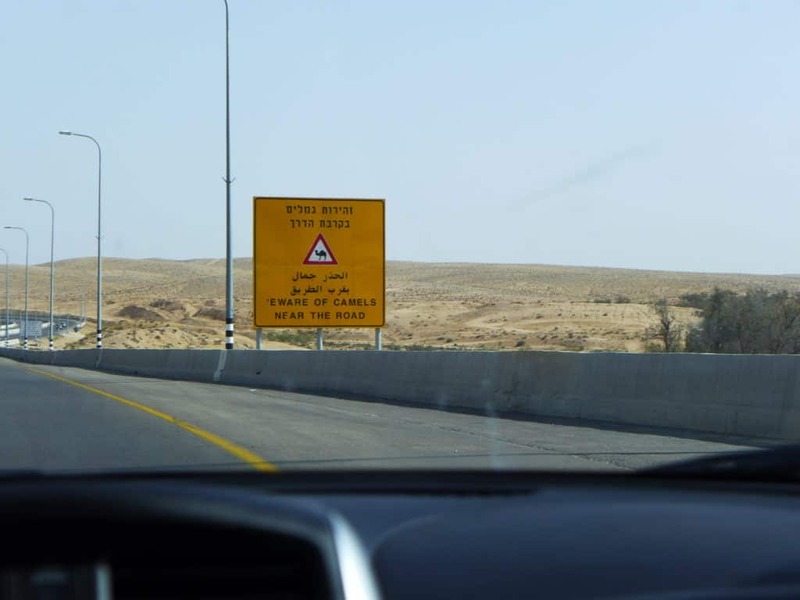 If you get into or out of Jordan by a land border, you will get a stamp in your passport, any other Middle Eastern country can easily tell you’ve been in Israel. If that’s a major concern, you may want to fly in and out. Also, make sure your passport is at least 6 months from expiring. 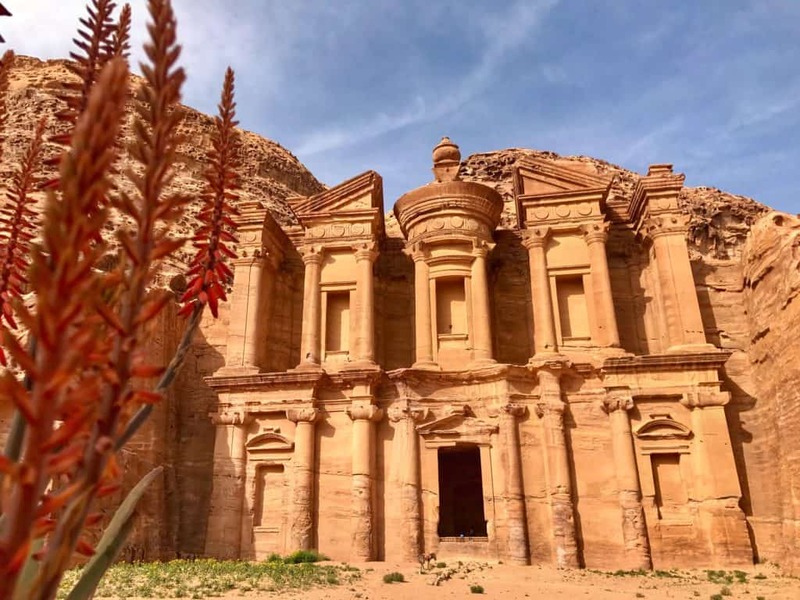 To get your visa in Jordan, you don’t need to do anything special. You just buy it in a special window at the airport or when crossing the border by land. It costs 40 JOD (about $60 USD) if you’ll be there less than 4 nights, or 10 JOD if you’re there longer. 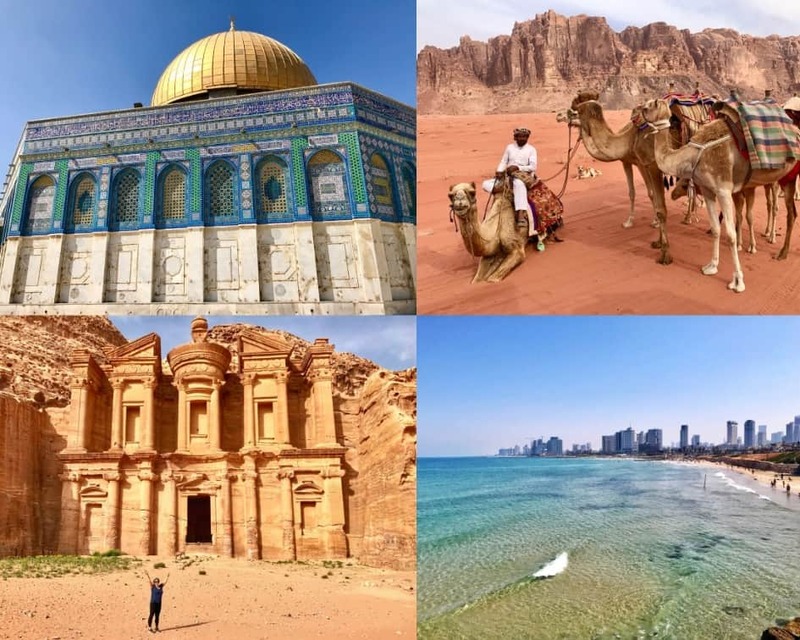 Additionally, there are exit taxes both when going from Israel to Jordan (about $25 per person) and also from Jordan back to Israel (about $15 per person). 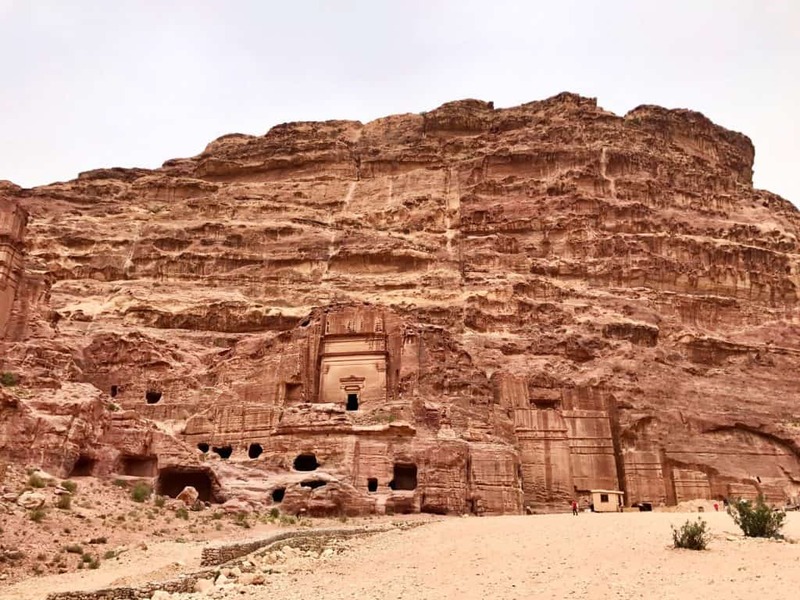 If you’re visiting Petra, make sure to keep your ticket and get your manifest (the paper they give you at the border) stamped; this will affect your exit fee when heading back to Israel. 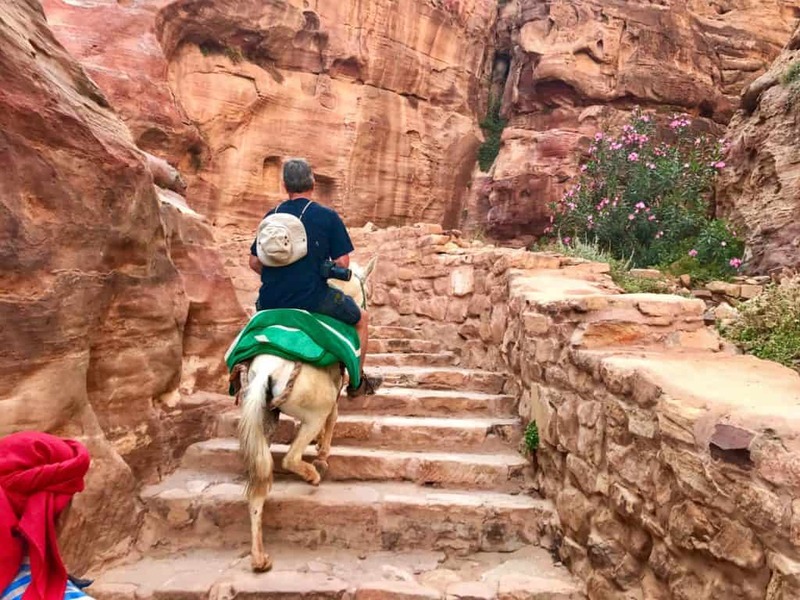 Taxis and buses are the two best ways to get around the Petra and Wadi Rum area. There are buses that go from the border to both Petra and Wadi Rum, and between the two as well. 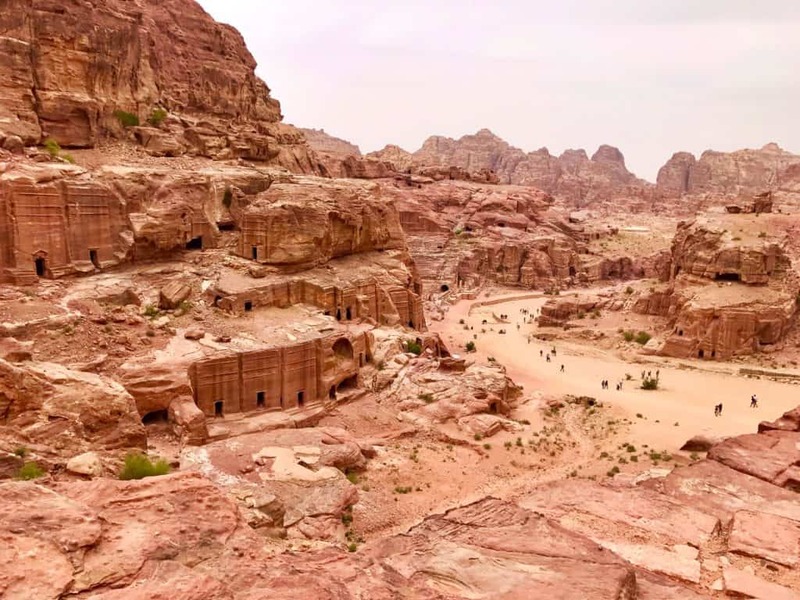 However, you will need a taxi to get to the bus station from the border, so in my opinion unless you are on a crazy tight budget, just spring for the taxi from the border to either Petra or Wadi Rum—so much simpler. We took the bus from Wadi Rum to Petra, it runs around 8:30am (there are probably a couple others too). This is a squishy time, not concrete, and it is quite cheap. But the bus ride took longer than I’d been led to believe, and honestly I think a taxi would have been simpler. It’s a fine option though. The Bedouin culture is more conservative in clothing than what many of us are used to, so you should be respectful in clothing choices. 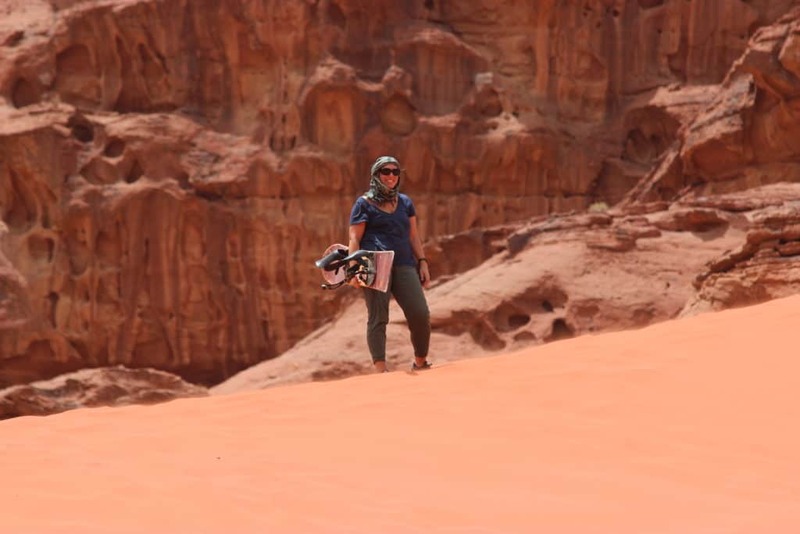 I wore loose and breathable hiking cropped pants and a loose v-neck t-shirt in Wadi Rum, and swapped out the pants for yoga pants in Petra. Is Jordan safe? Short answer, I’d say yes. I provide more info on that and more in this post. 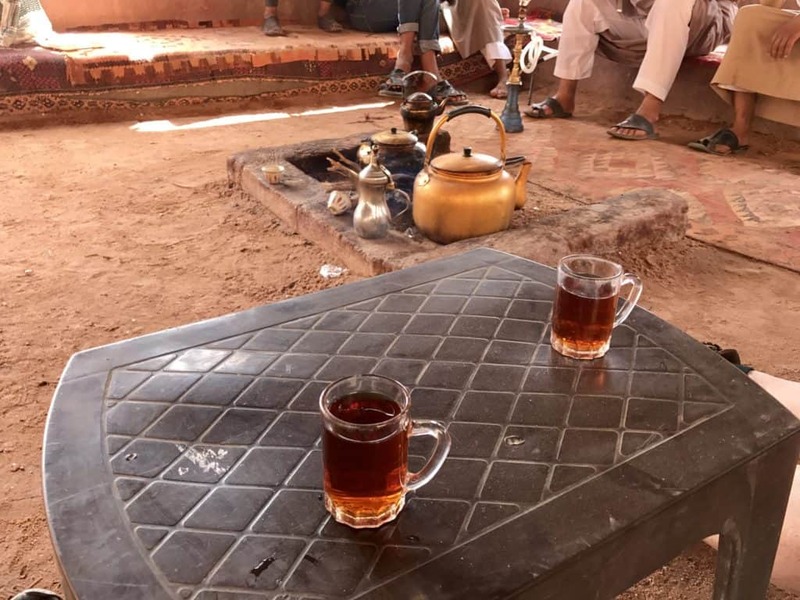 That said, Jordan is a male-dominated culture, and if you are a woman traveling with a man (or even by yourself), it will be common for men to avoid eye contact with you and address the man you’re with even if you asked the question or made the plans. This happened a lot with me and my dad, and while it was disconcerting, it was never hostile or anything—just a cultural difference. Everyone also thought my dad and I were married, which was also super weird for me. Alcohol is only available in Western hotels and is heavily taxed, as Muslim culture prohibits alcohol; a beer will set you back quite a bit, so just have appropriate expectations in Jordan. 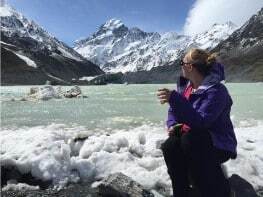 Want to know all my inside trip planning tips? Download my e-book here! The biggest consideration is whether to rent a car in Israel, and unless you have friends willing to drive you around I’d stronly consider it. Within Tel Aviv and Jerusalem themselves, relying on taxis and public transportation makes perfect sense. 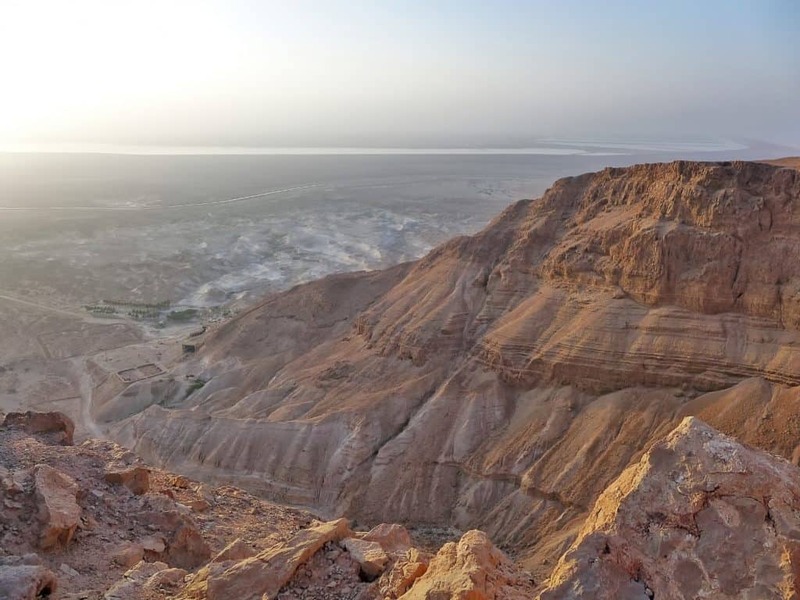 And you could fly from Tel Aviv down to Eilat for the Jordan portion of the itinerary. 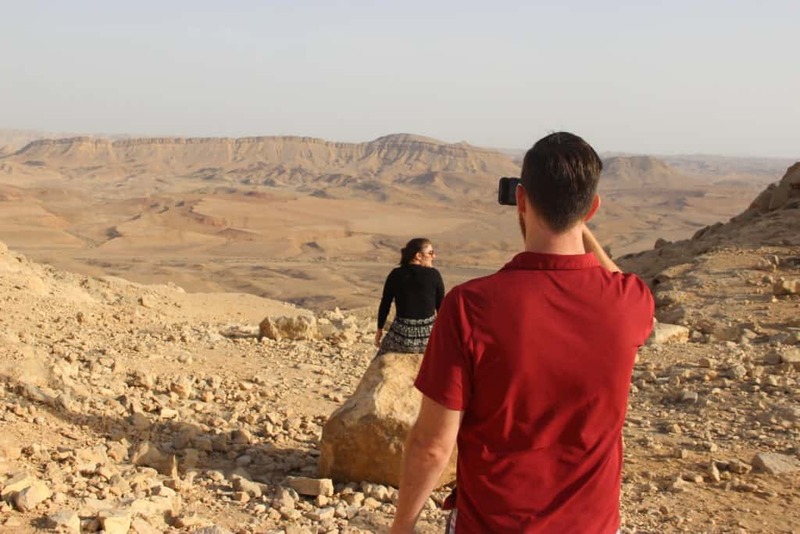 You could also join group tours for seeing Northern Israel and the Negev Desert. You will just give up a lot of autonomy and won’t be able to stop everywhere you want. 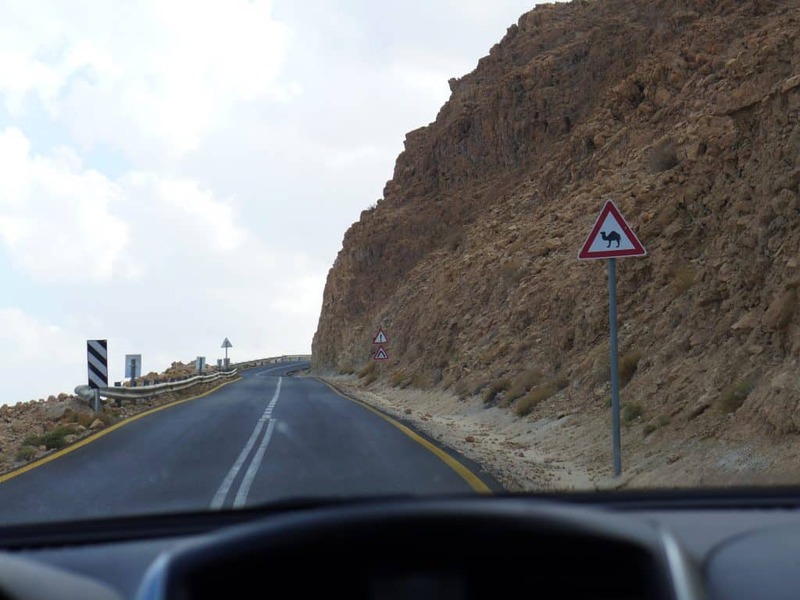 Driving within most of Israel is super easy, with great highway infrastructure and easy to read signage. You can’t take rental cars into parts of the West Bank, or across any country borders, but otherwise you’re golden. We stayed at the Abraham Hostel Tel Aviv while there, and the Abraham Hostel Jerusalem as well, in private double rooms. They have a a good continental breakfast and the Tel Aviv one at least has a cool bar in it too. And they run lots of city tours as well, with discounts for people that stay at the hostel (we took the Masada, En Gedi, and Dead Sea tour). 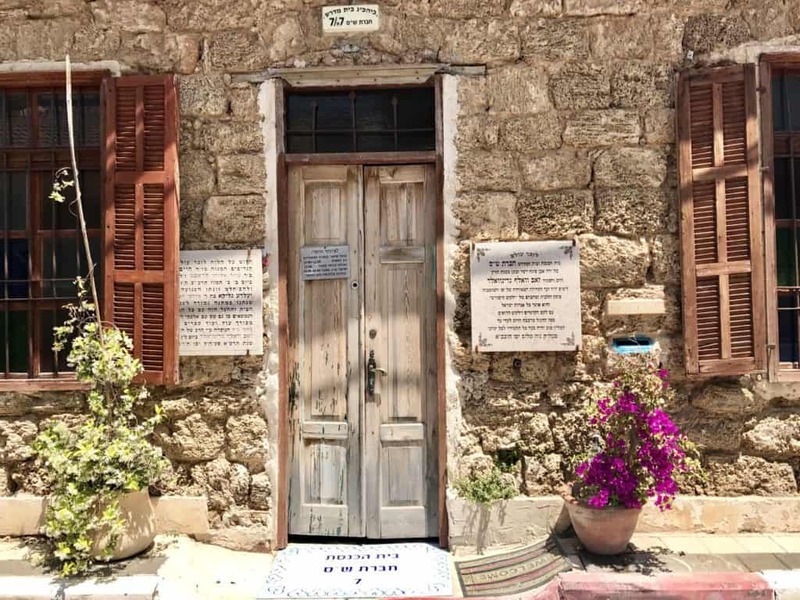 On our quick overnight in Eilat, we stayed at Cactus B&B. In Wadi Rum we booked with Bedouin Directions, and spent the entire day in the desert doing a jeep tour with them, followed by a night in the Bedouin camp. 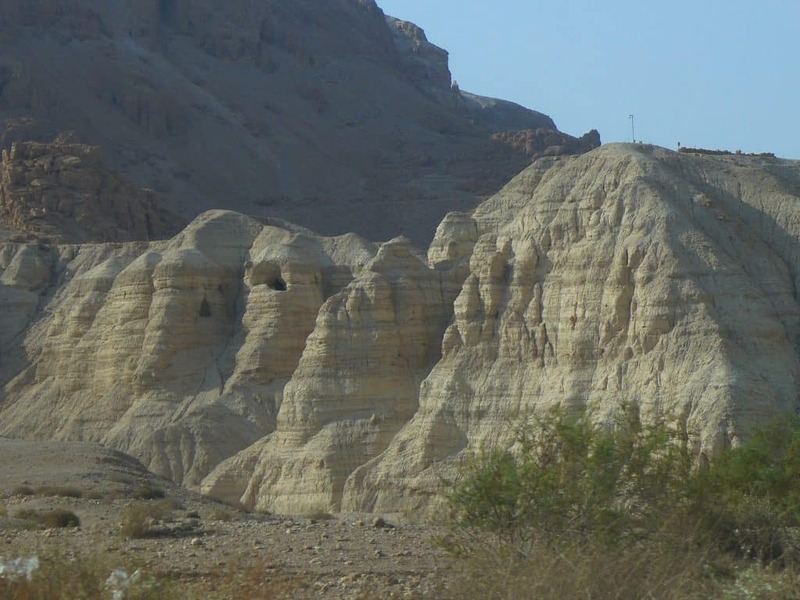 In Wadi Musa (where Petra is), we stayed in Sharah Mountains Hotel and it was great. My dad and I flew Turkish Airlines, which I’ve always found to be super comfortable. We took advantage of a long layover in Istanbul on the way back to get out and see Istanbul a bit (one of my fave cities!). We arrived in Tel Aviv in the evening, and my friends Steven and Danielle picked us up. Getting through customs at the Tel Aviv airport was pretty smooth, though we ended up waiting in line for a bit. Overall our customs and security experiences weren’t bad at all, but you need to be ready for anything at the Tel Aviv airport since security can be quite intense at times. We were up early the morning after arriving, and on the road with my friend Steven. 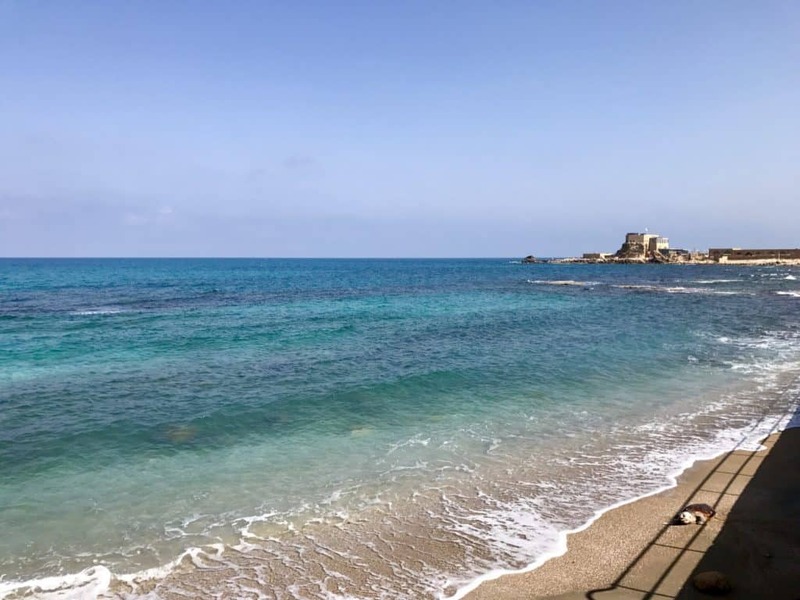 After a quick stop in Netanya (an enclave of French emigré Jews) for delicious French pastries, we arrived in Caesarea Maritima. 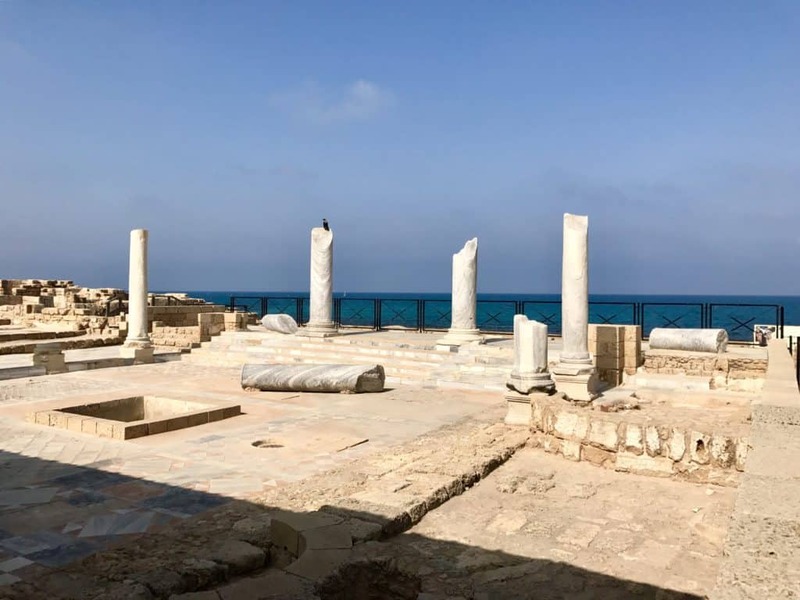 This port city dates back to the 500s BCE originally, and was a major port and vacation home for Herod the Great. The sea views from the hippodrome are particularly primo. You can read more about our trip through Northern Israel here! 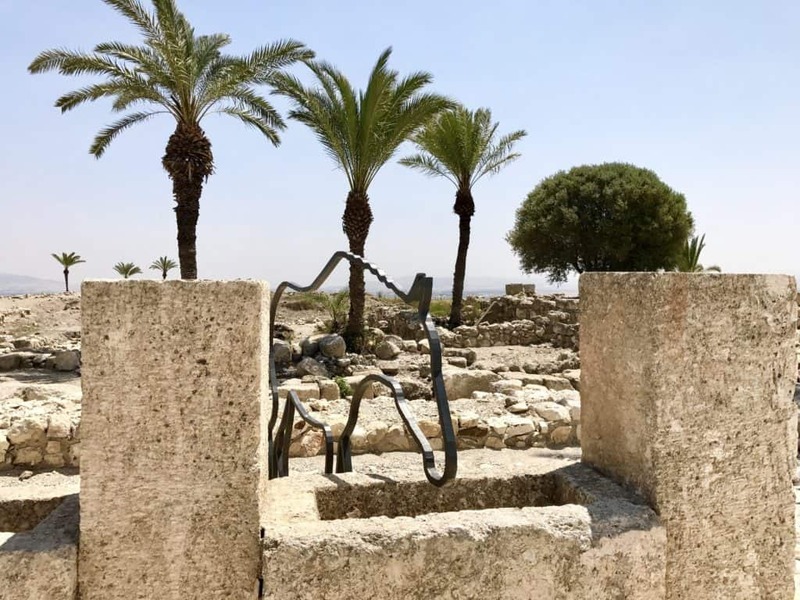 After Caesarea, we headed inland to the famous biblical tel of Megiddo. A.k.a. 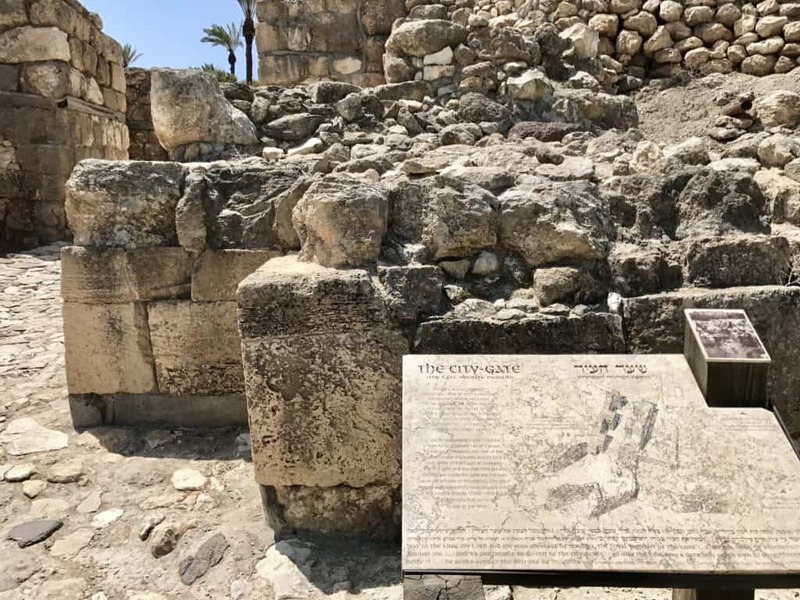 Har-Megiddo or the Armageddon spoken of in the bible. 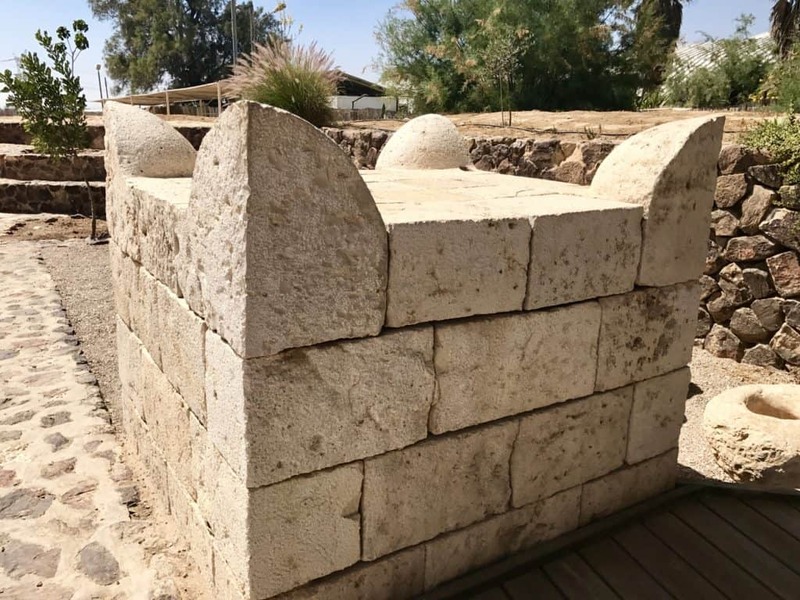 A “tel” is just an archaeological mound, and while there are over 200 tels in Israel, only 3 of them have been officially designated as biblical tels. So Megiddo is kind of a big deal. It was in ancient times as well. Overlooking the Jezreel Valley, the city was strategically important for millennia since it sat at the crossroads of major trading routes. It saw a LOT of war over the centuries (even as recently as WWI), and there are close to 30 different layers of civilizations piled on top of each other to make the mound. 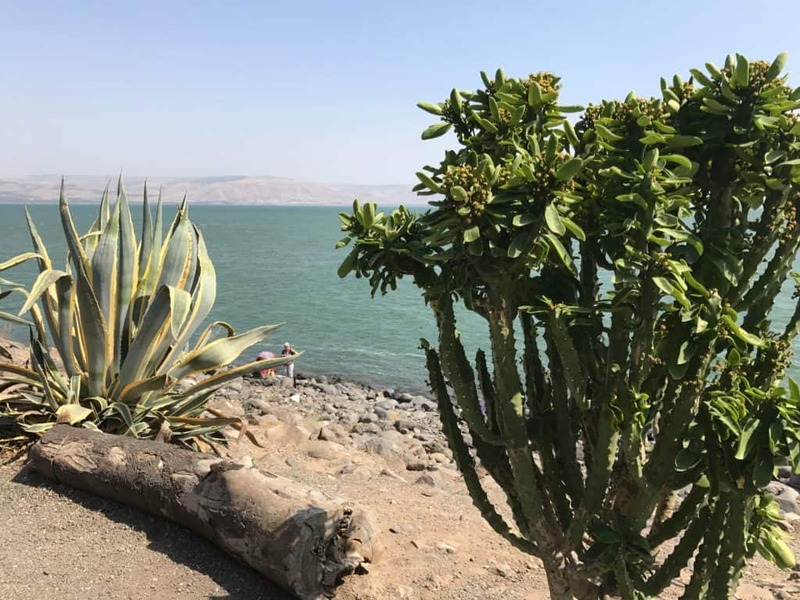 After Megiddo, we stopped for a stroll and delicious street food shawarma lunch in the resort town of Tiberias, right on the Sea of Galilee. Then we did some exploration in the Galilee area. 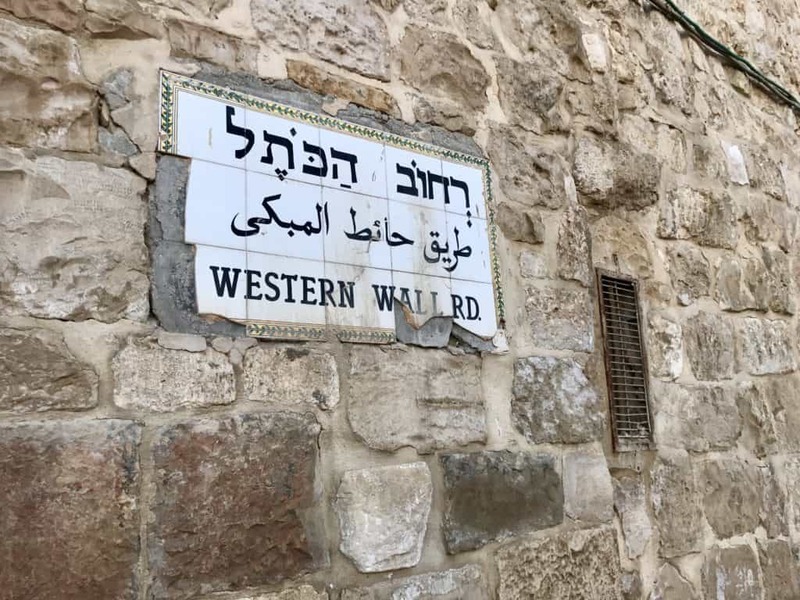 Famous for being the center of much of Jesus of Nazareth’s ministry, this whole area is a mecca for Christian tourists. Seriously, busloads of them. I’m happy to have been here and seen some of these sites, but many of them feel too manufactured for me. Capernaum is definitely interesting, though. 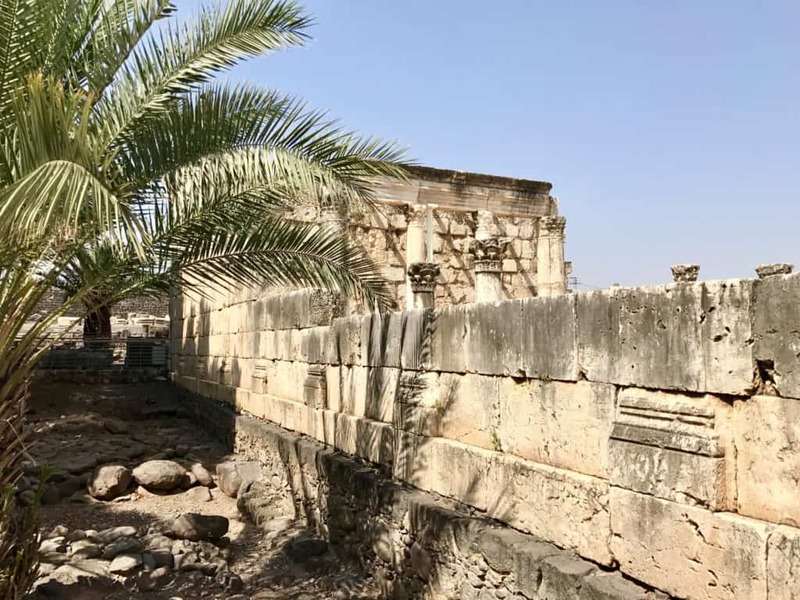 It’s where many believe the Jesus lived much of his adult life (and where Peter was from), and also is one of the three cities He famously pronounced “woes” on in the bible (the other two were Chorazin and Bethsaida). It’s got a lot of black basalt rock that makes the building ruins quite striking. Once you’ve had your fill of the ruins, you can go down and chill by the Sea of Galilee for a bit if you’d like. 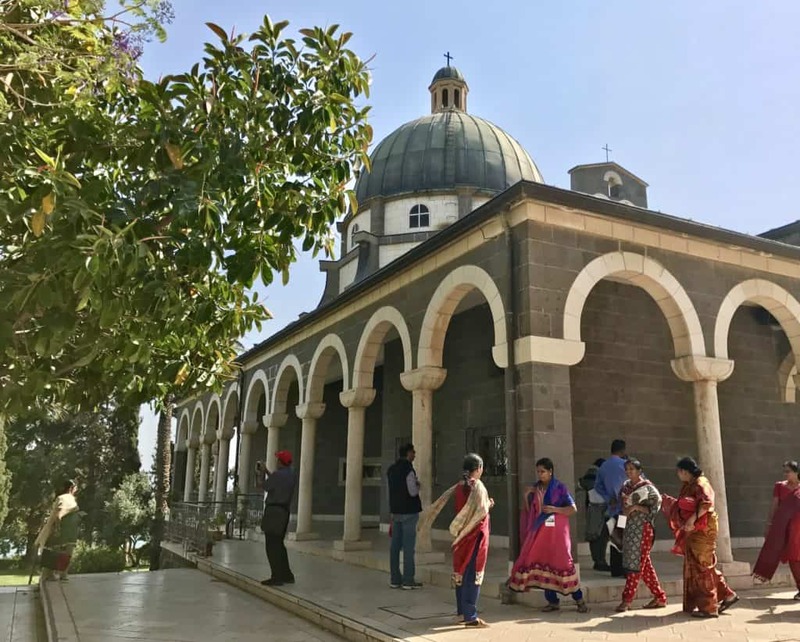 To round out our little tour of the “Jesus Trail”, we visited the supposed Mount of Beatitudes, where Jesus gave His famous Sermon on the Mount (you know, “blessed are the meek” and all that). 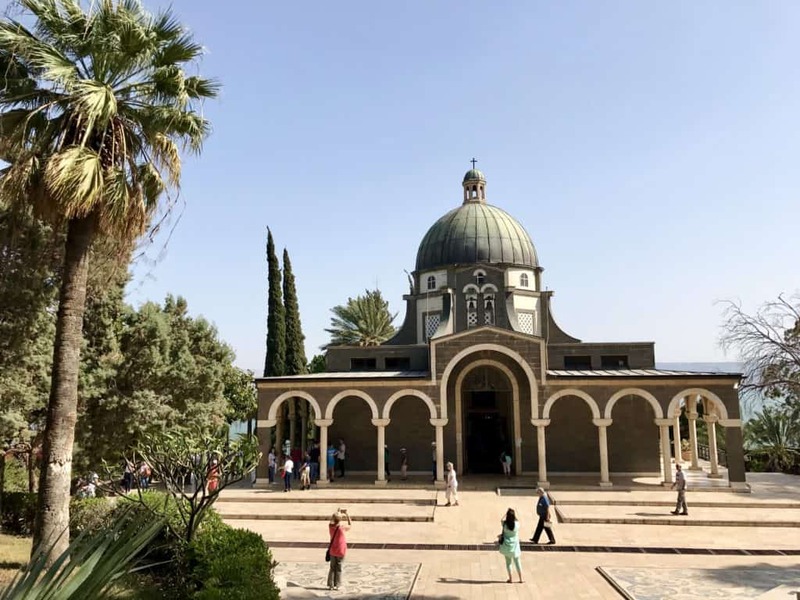 I was not a fan of the Mount of Beatitudes, which is just a tourist destination, though it does have some lovely landscaped gardens. Nothing much historical here from what I could see though. However, I was oddly fascinated by this cinderblock church. It’s just…very eye-catching. 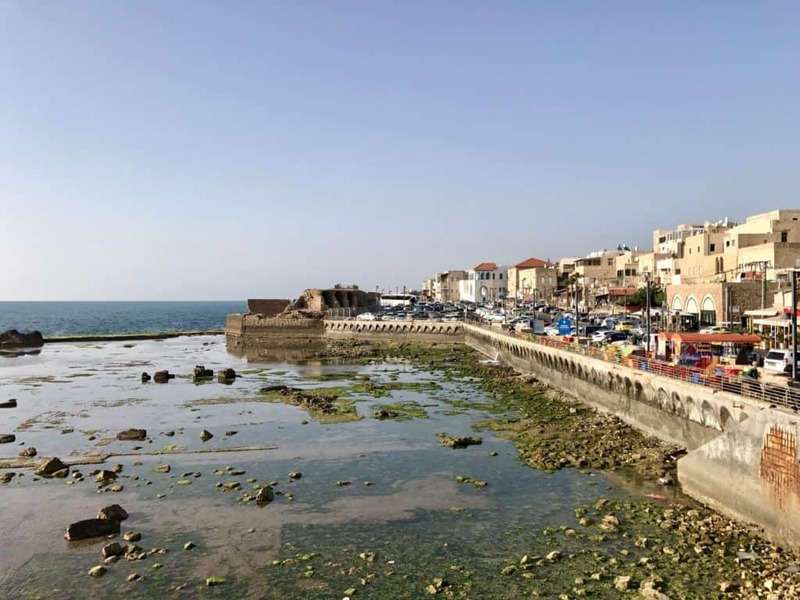 After leaving the Sea of Galilee area, we continued on to Akko (also called Accra, Acre, etc.). 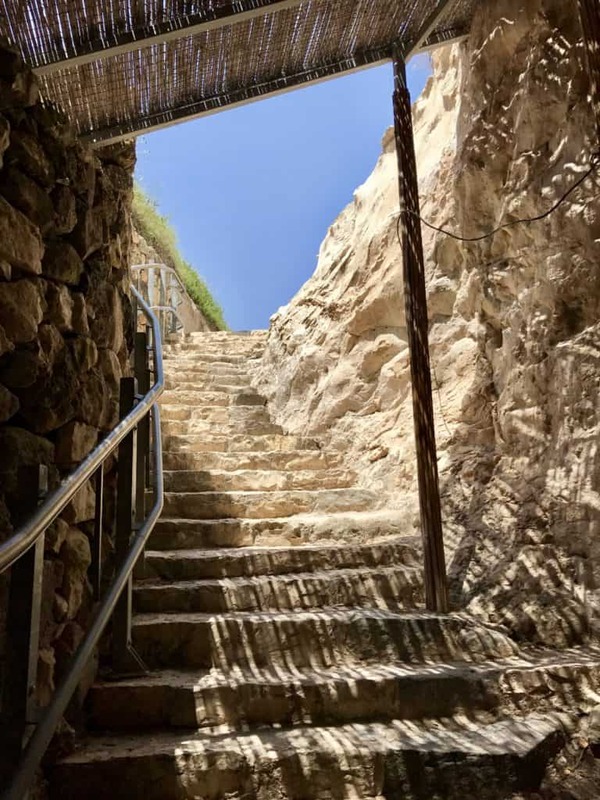 It’s one of the oldest continuously-inhabited sites in Israel (which is saying something! ), with a rich history ranging from ancient seafarers to Romans to Crusaders. It’s also an Arab-majority city. 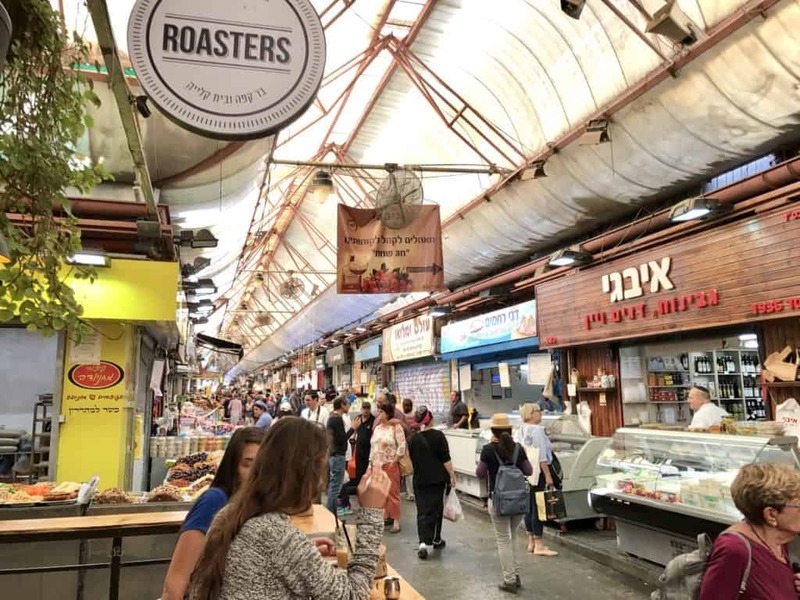 We walked around the famous market, which was fairly quiet since it was late on a Friday (a holy day for Muslims and preparation day for the sabbath for Jews). We had a lovely dinner of different dips and salads, and then when we walked outside after dinner were greeted by one of the most magical sunsets I’ve ever seen. On our way home we stopped for a few minutes in Haifa to see the Baha’i Gardens lit up at night. 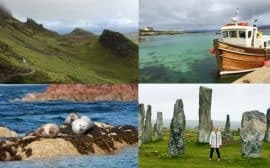 They’re definitely spectacular, so if you have time to visit them within your itinerary I’d recommend it. It was a late night for us since we’d crammed a lot into our day, but completely doable and worth it. Read this post for more details on our Northern Israel route and each of our stops. 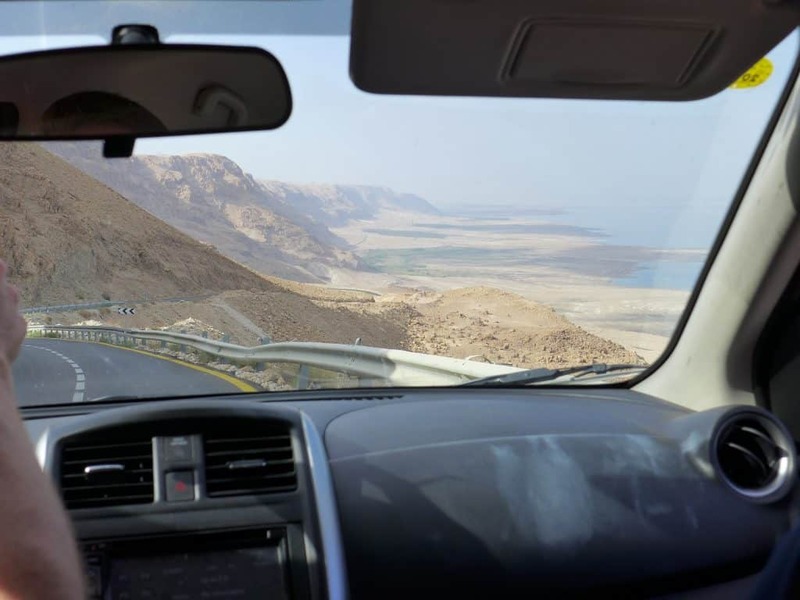 This assumes you’re coming from Tel Aviv, but if you’re coming from Jerusalem you won’t be able to accomplish quite as much (shave an hour or more off your exploration time) since it’s a longer drive. 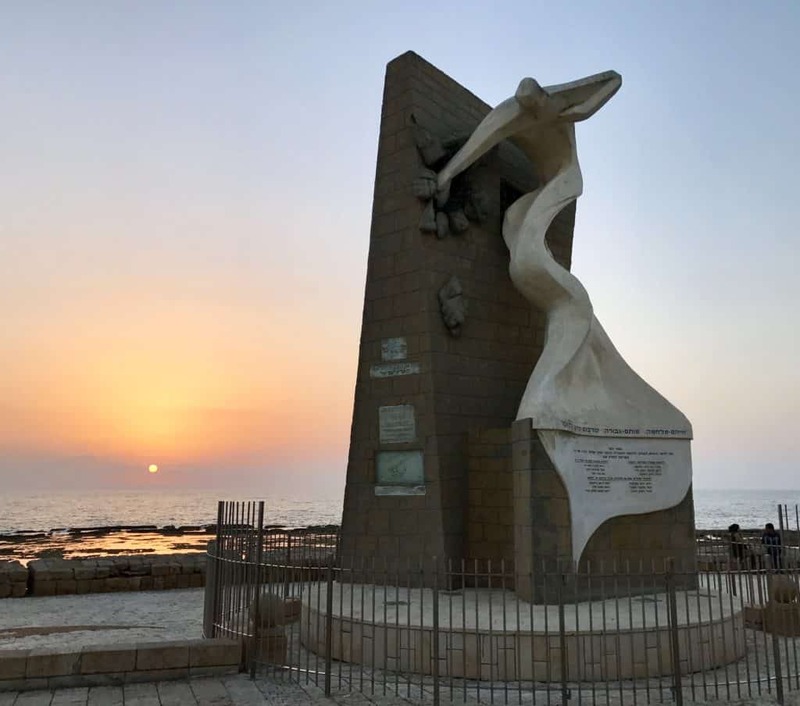 You also could visit Haifa instead of Akko if you’d rather explore the Shrine of the Bab, Baha’i Gardens, and Mount Carmel. 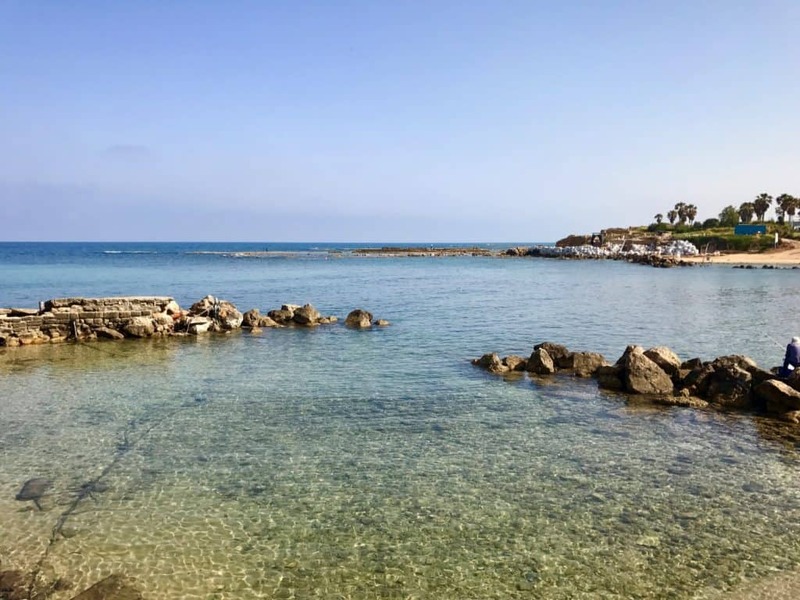 If you have a second day to spend in this area, there is a lot more around the Sea of Galilee and you could get up to the white cliffs of Rosh Hanikra (I was bummed to miss this! ), as well as Golan Heights (which as wineries). 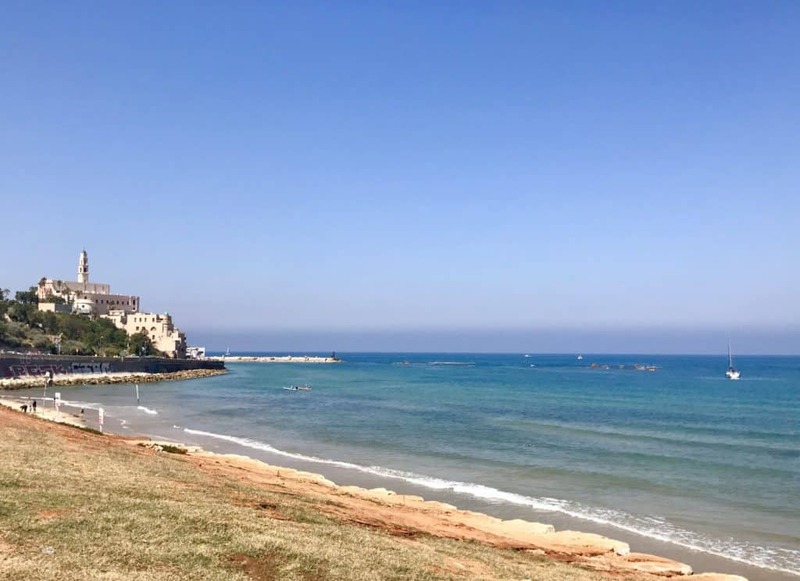 One of my only regrets about this trip itinerary—because it was mostly amazing—is that we didn’t spend enough time actually exploring Tel Aviv. I used it as a base for a couple nights, but we only actually spent a morning walking around the city. And it deserved more, because Tel Aviv is AWESOME. 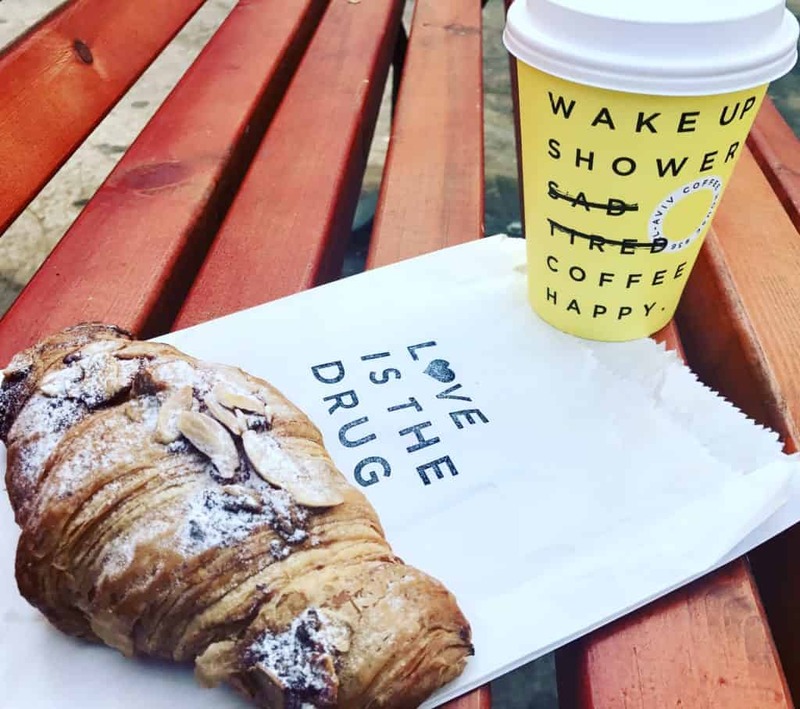 You can read more about what to love about Tel Aviv in this post. One of the big draws is the beautiful Mediterranean beach. It’s the most beautiful, totally natural beach I’ve seen in a major city. 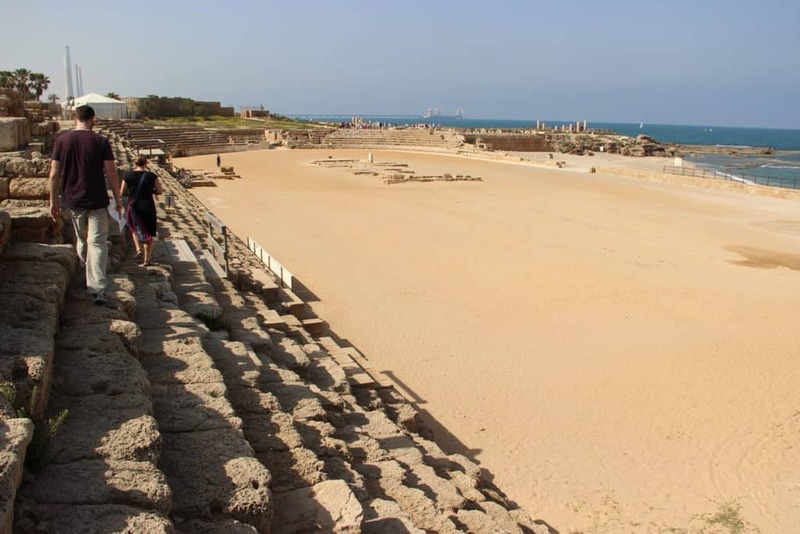 If you walk up to the path that runs down the coast, you can look to the right and see the very modern city of Tel Aviv, and to the left the ancient port of Old Jaffa. It’s truly a fascinating juxtaposition. 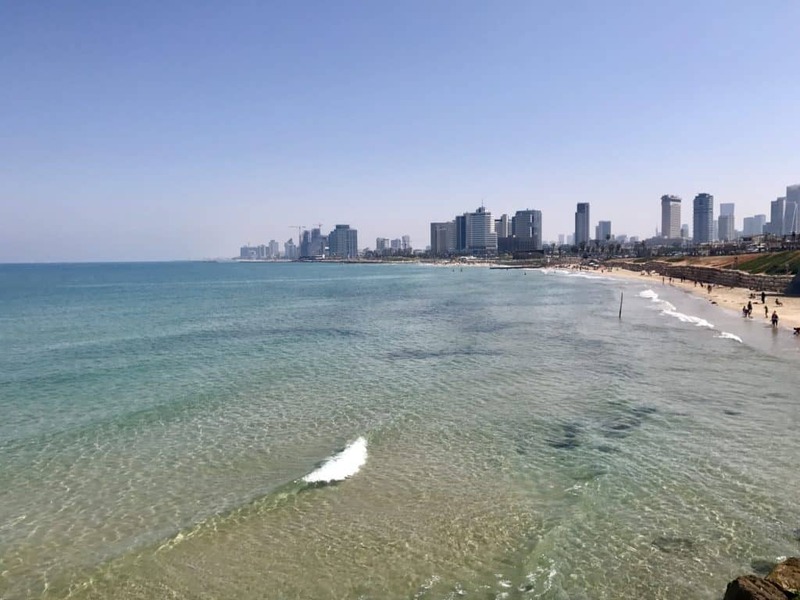 As a bit of background, Tel Aviv is a very modern city, only founded in the early 1900s. But next-door and now included is Jaffa (also Yafo, Joppa, etc. ), one of the oldest functioning ports in the world. Because it’s such a strategic natural port, it’s been controlled by everyone and their dog over the millennia…from the Canaanites to the Egyptians, Philistines, Assyrians, Israelites, Persians, Greeks, Romans, and soooo many more. Napoleon even conquered it before the British seized control in 1917. This port got around. Which means it is steeped in history. We were there on a Saturday morning, but Tel Aviv is pretty secular and so while many businesses were closed, that meant that the locals were out and about. The city was ALIVE…not the sleepy weekend morning I’m used to in European cities. 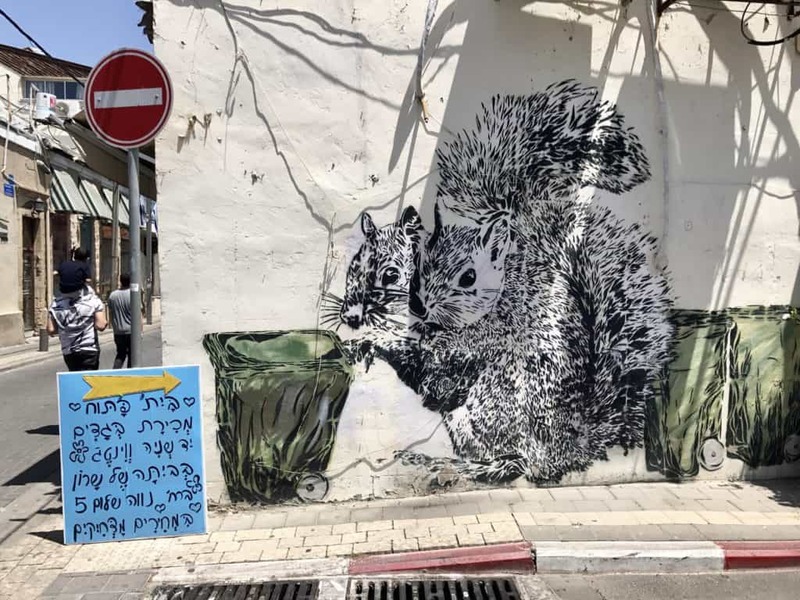 My dad and I grabbed coffee and pastries and just walked around, savoring the hot sun, gorgeous water, quirky street art, and vibrant culture of Tel Aviv. Then we headed into Old Jaffa to explore the maze-like narrow streets and alleys. 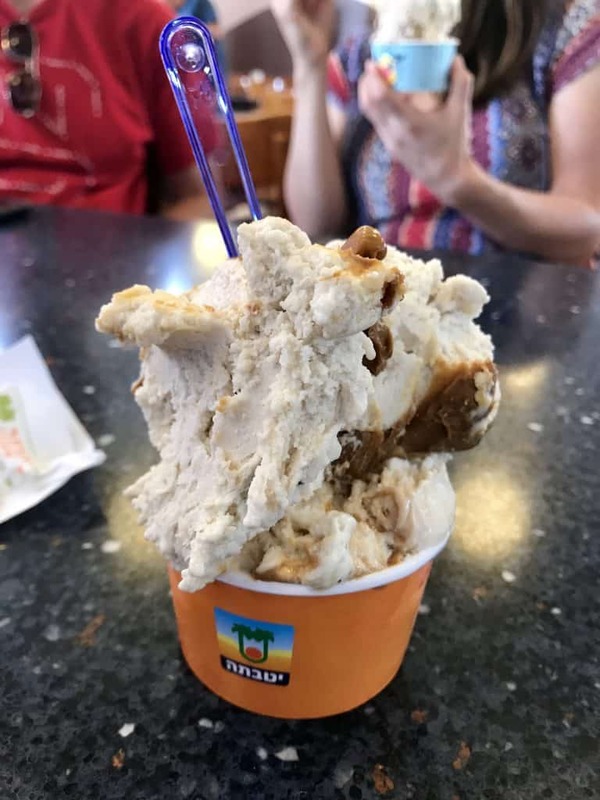 A stop at the famous Abulafia bakery was in order as well, where we grabbed some savory stuffed pastries for lunch, which we enjoyed back on the waterfront. I was bummed we didn’t have more time to spend in Tel Aviv and Jaffa, but we had to meet up with Steven and his wife Danielle and head south. 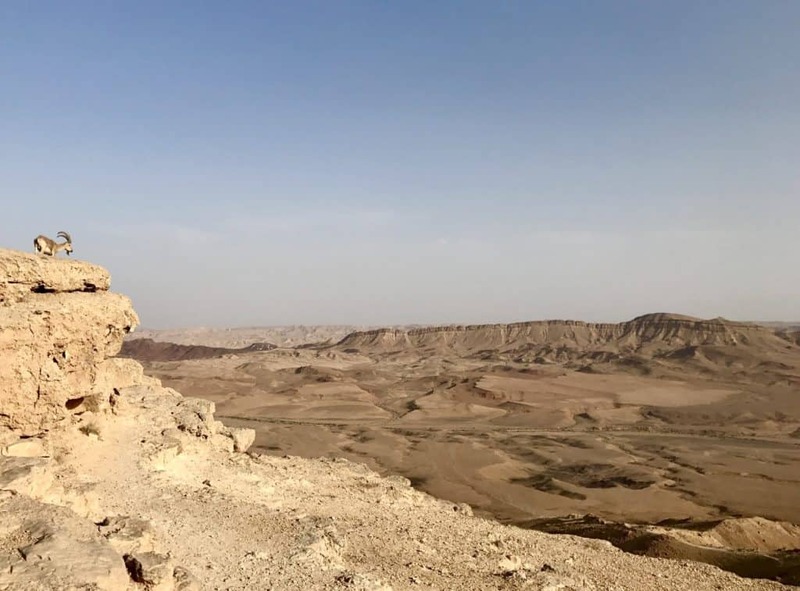 Our final destination of the day was Eilat, since my dad and I were headed over the border into Jordan the next day, but our afternoon drive was taking us through a few key stops in the Negev Desert. 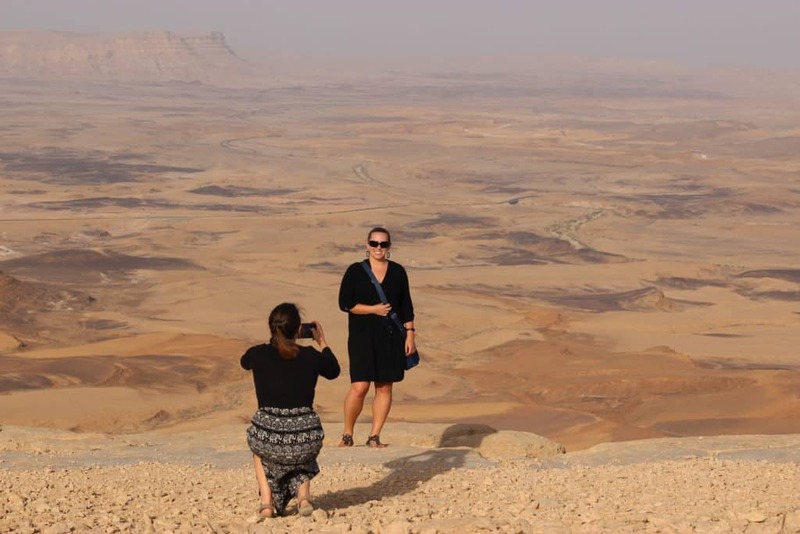 You can get a much more detailed rundown of our Negev Desert stops in this post). 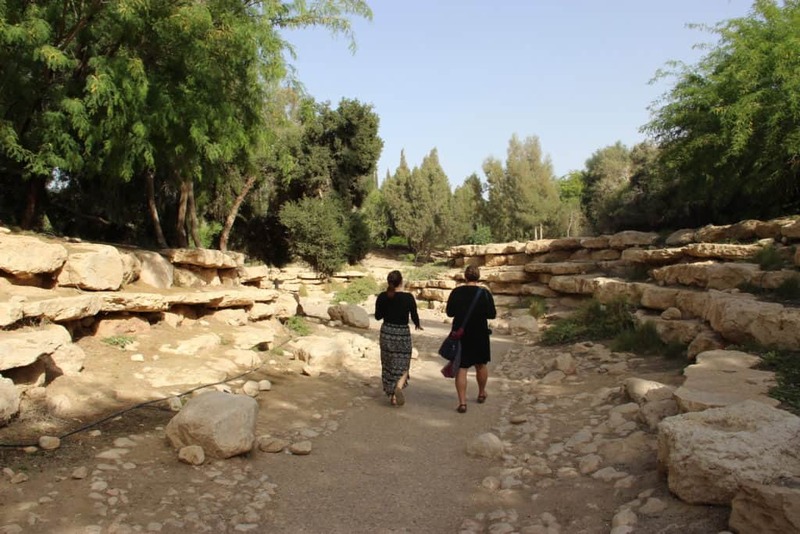 Our first was the second of the three biblical tels, Tel-Beersheba. 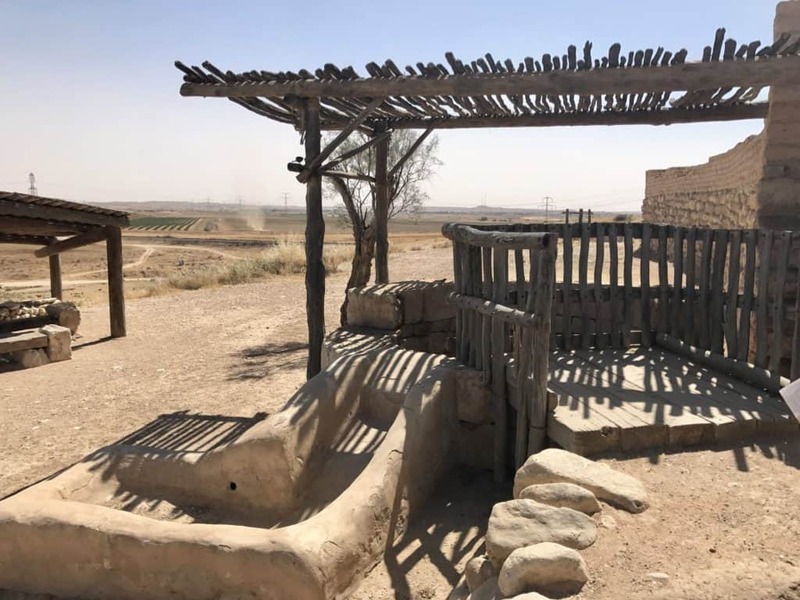 The wells from which it gets its name (be’er means “well”) are mentioned several times in the early books of the bible. This is definitely worth a quick stop on your road trip. Sde Boker (pronounced shuh-de boquer) was our next stop, famous as the home and final resting place of David Ben-Gurion, Israel’s first prime minister. 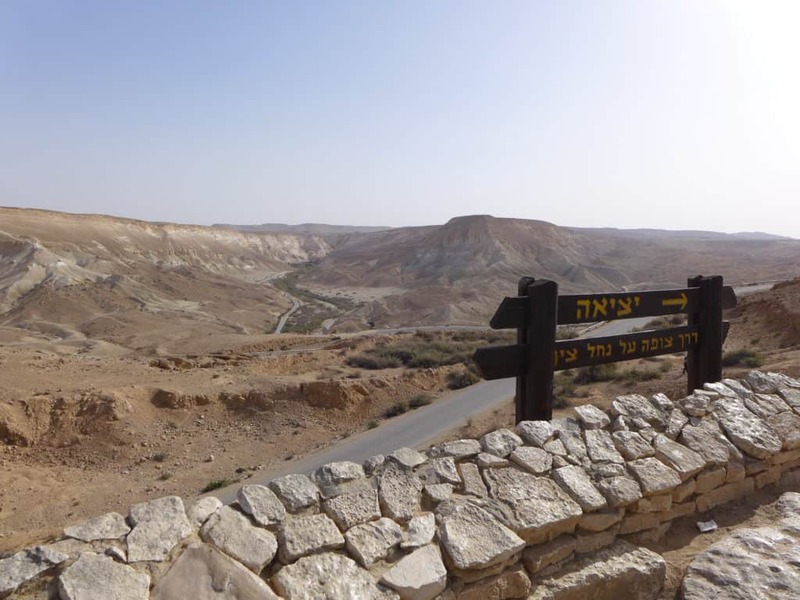 Ben-Gurion was passionate about the need to have people settle in the Negev Desert, and led by example—after he was no longer the prime minister, he moved here permanently and was a fully-participating member of the kibbutz. The paths through here are super peaceful and provide a lovely respite from the heat. The stark, harsh desert you can see behind us in the picture is Ein Avdat, which has a lot of well-known hiking trails (but bring water!!!). Finally just 30 minutes down the road, we stopped at Mitzpe Ramon (or Makhtesh Ramon). The Ramon Crater is the world’s largest erosion crater (meaning it’s not made from impact or a volcano), and it truly looks like you’re on Mars or something. It’s 40 km long (about 25 miles), anywhere from 2 to 10 km wide, and about 500 meters (~ a third of a mile) deep. It’s INSANELY MASSIVE. From here it’s quite a long haul down to Eilat (close to 2 hours), with not a lot to do or see (plus, we were running short on time). There are a few tips on entrance fees and such at the bottom of this post. The next morning we got up early and Steven drove us to the border. 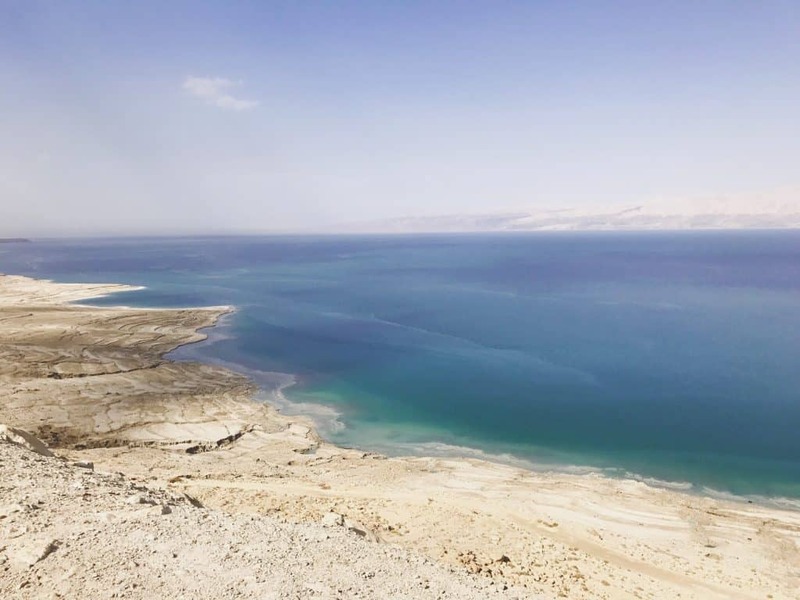 It’s only about five minutes, but you’d need to either take a cab or have your own car, it’s not really something you’d walk from the main part of Eilat. We went through all the different security checks and walked across the border into Jordan. We waited in the parking lot for our taxi driver to arrive, then he drove us about an hour to the village of Wadi Rum. 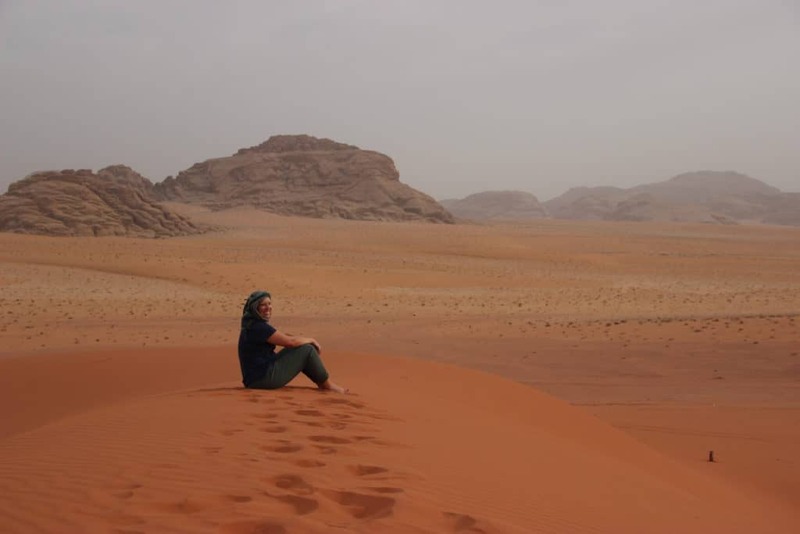 We had booked a full-day jeep tour of the Wadi Rum desert, followed by sleeping in a Bedouin camp. 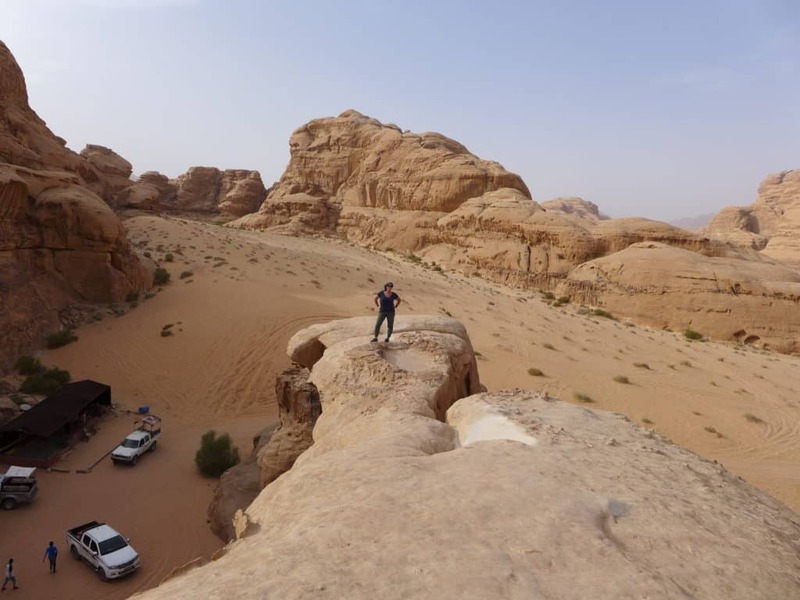 I’ll highlight a few of my favorite pics and some of the big stops below, but you can read tons more about our experience in Wadi Rum in this post. 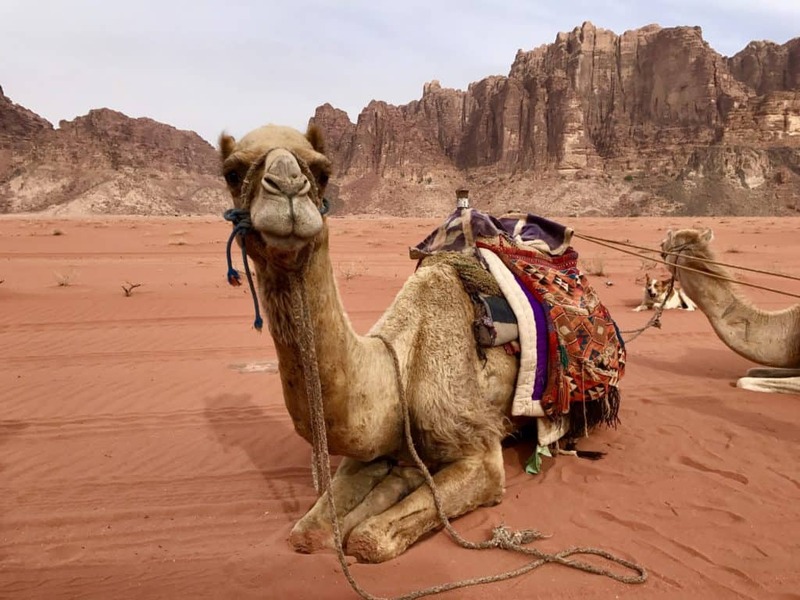 Wadi Rum is a protected desert wilderness in southern Jordan. It often looks like you’re on another planet, but you also feel the weight of millennia of history here. Sitting on a cliff overlooking the red sand, I kind of felt like Moses and the Israelites would wander around the corner at any moment. Our first stop of the morning was at the Lawrence Spring, where we scrambled up a big cliff for a great view of the valley. 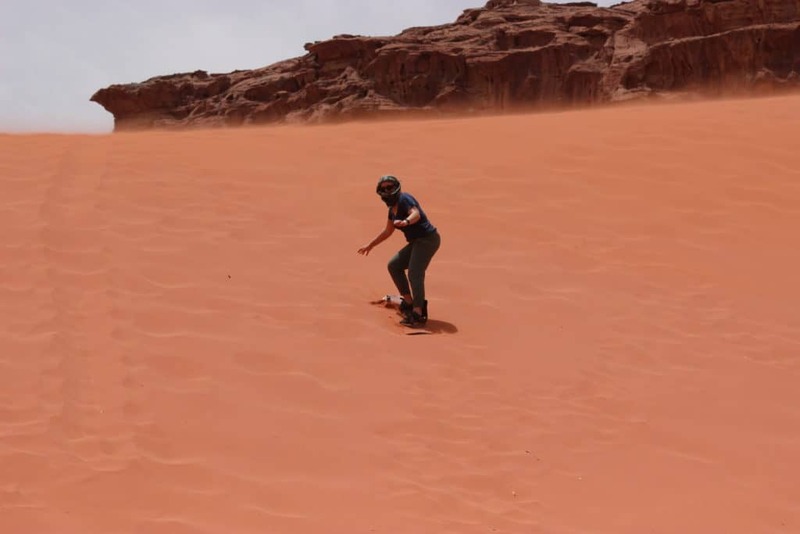 We refreshed ourselves with the omnipresent hot sweet tea that you’ll find all over the Middle East, and then tried our hands at sandboarding on the dunes. 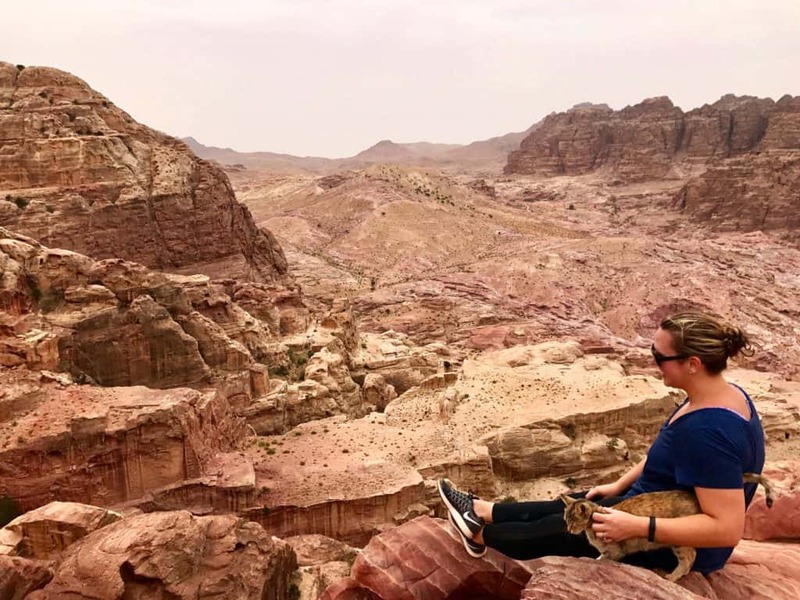 Throughout the day we explored canyons, examined ancient Nabatean carvings in the rock, climbed up giant rock arches, posed in front of the Mushroom Rock, and enjoyed various views of this otherworldly landscape. Throughout the day, our guide, Mohammed, told us about the history of the area and the Bedouin people who still live here. 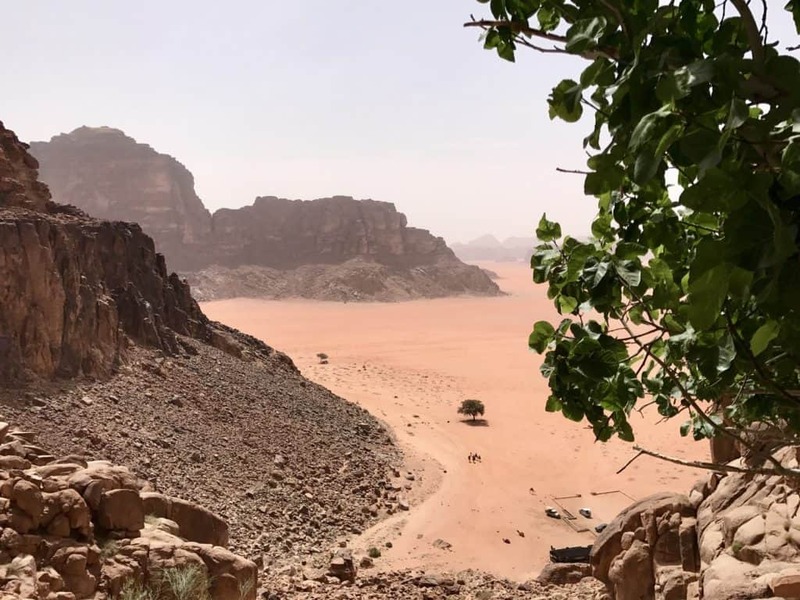 After watching the sun fade over the red sand, Mohammed took us to the camp, which was tucked between several cliffs to avoid the desert wind. 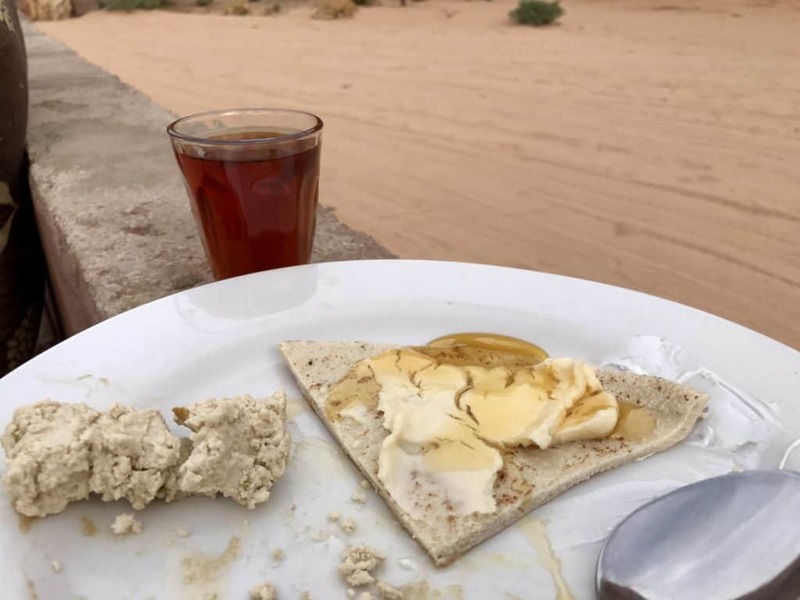 We enjoyed a traditional dinner—cooked over coals under the sand all day—and then watched the sun come up while enjoying halva, bread and honey, and tea for breakfast. 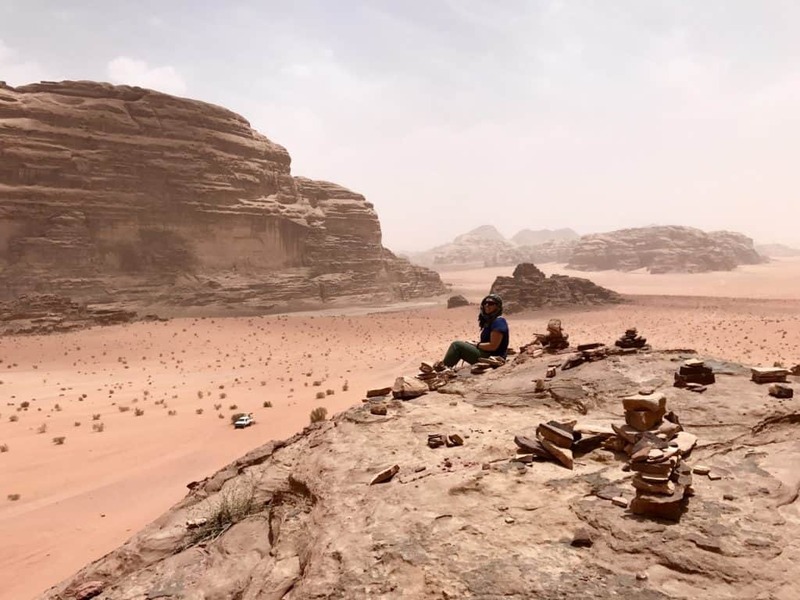 Our time in Wadi Rum was absolutely amazing, and if you’re planning to spend any time in Jordan at all then it HAS to be on your itinerary. 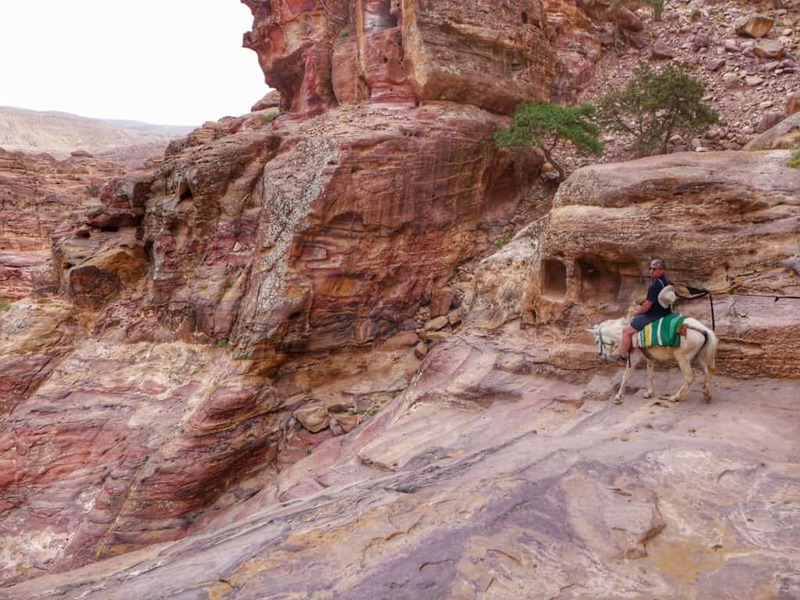 It’s easy to get to from the Eilat/Aqaba border, and even just one day out in the desert will blow your mind. 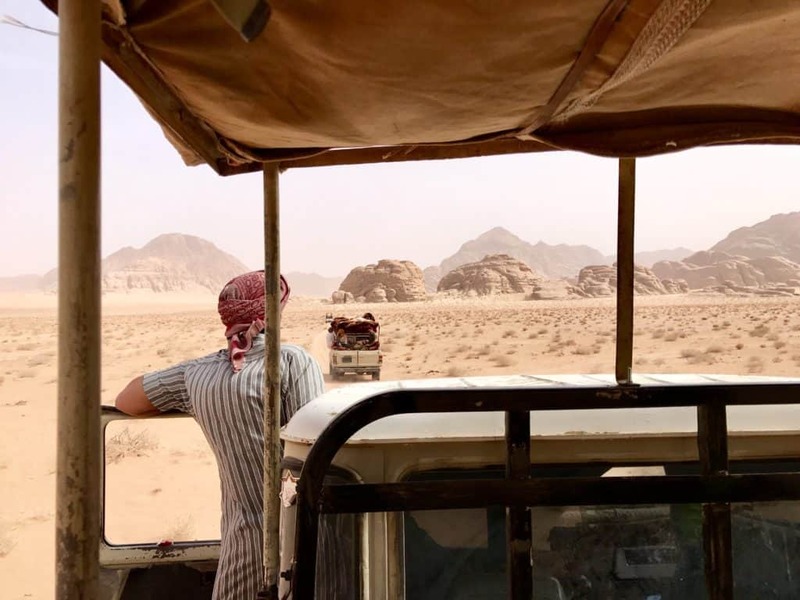 We booked with Bedouin Directions, and had a great time with them so I’d highly recommend—you can find out more about costs and details in my post about Wadi Rum. If you have the time, one other thing I’d recommend is doing a sunrise hot air balloon ride! But alas, we didn’t have the time for hot air ballooning because we had to catch the 9:00(ish) morning bus from Wadi Rum over to Petra. The bus ride took a little longer than I’d been led to believe, but we got into Wadi Musa and found our hotel, then it was probably around 1:00pm by the time we made it down to Petra’s entrance. 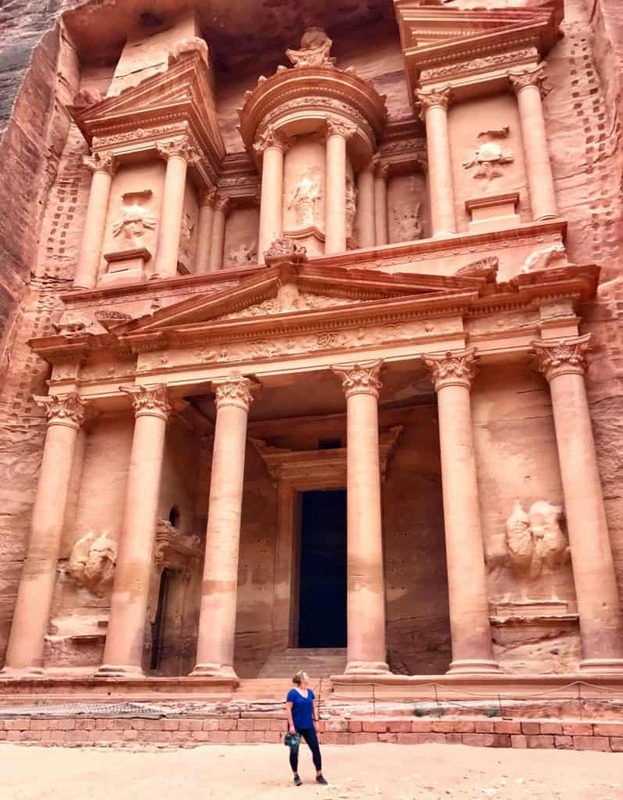 The Lost City of Petra is one of the New Seven Wonders of the World, and has been at the top of my bucket list since I was a teenager, so I was BEYOND excited at the prospect of visiting. It’s honestly challenging to truly convey how I felt there after years of poring over pictures. 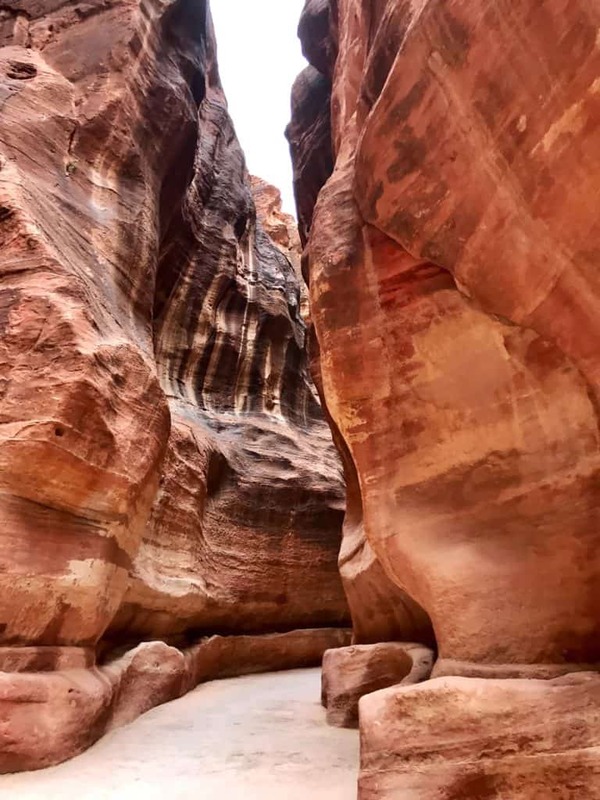 As you walk through the undulating walls of the Siq, you can picture the caravans of spice traders who did exactly the same thing a couple millennia ago. And as you round the corner and capture your first glimpse of the famous Treasury, you’ll be in awe of the size and detail of the carved facade. 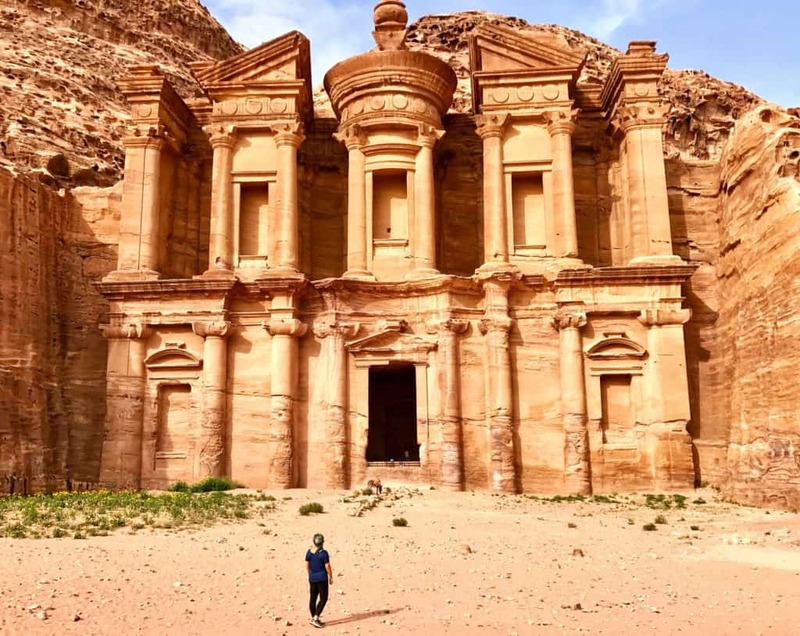 And that’s just the beginning…what I have below will just whet your appetite, but you can read more in my ultimate first-timer’s guide to Petra. The thing is, though, the Treasury is just the first carved building you come to. There is an unbelievable amount more to see and do there. My dad and I were only there for half a day, and did as much as we could. But you could easily spend a few days, or even a week if you wanted to really explore the whole area. 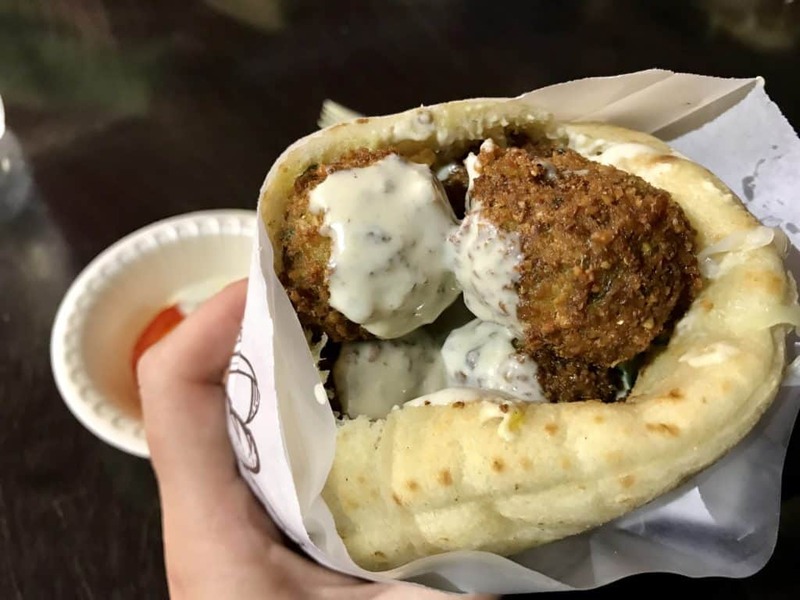 We walked through the Street of Facades and then tried to climb to the High Place of Sacrifice (though didn’t make it all the way due to time), then grabbed some hot fresh falafels and made a game plan. The afternoon was getting away from us, and I *really* wanted to see the Monastery, but my dad’s hip was killing him. So we ended up giving in to some mule wranglers who’d been hounding us and riding mules up to the Monastery. They are so incredibly sure-footed, it’s amazing! I have some mixed feelings about the animal situation at Petra overall though, which I talk about in more length in my Petra post. Because it was so late in the day, we had the Monastery all to ourselves. It’s maybe even more impressive than the Treasury, and we were blessed with like 10 minutes of blue skies right when we were here—the rest of the day was overcast, so this was a huge photo win! Finally we had to get back to the entrance quickly for closing time. I have a bunch more super helpful tips in my detailed post, but one of the most important things to know is that if you wait until right at closing time, you’ll have the Treasury to yourself and can get good pics without all the crowds! 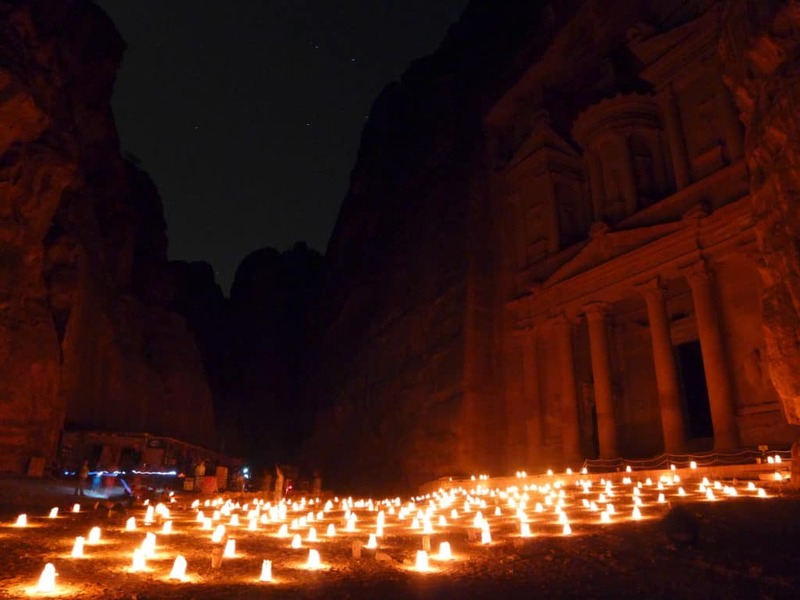 Also, if you’re planning to attend Petra by Night, you can actually stay in the park while they set up. This allows you to get some good pics before everyone arrives (though not sure how you’d get the Siq lantern photos, but still…). 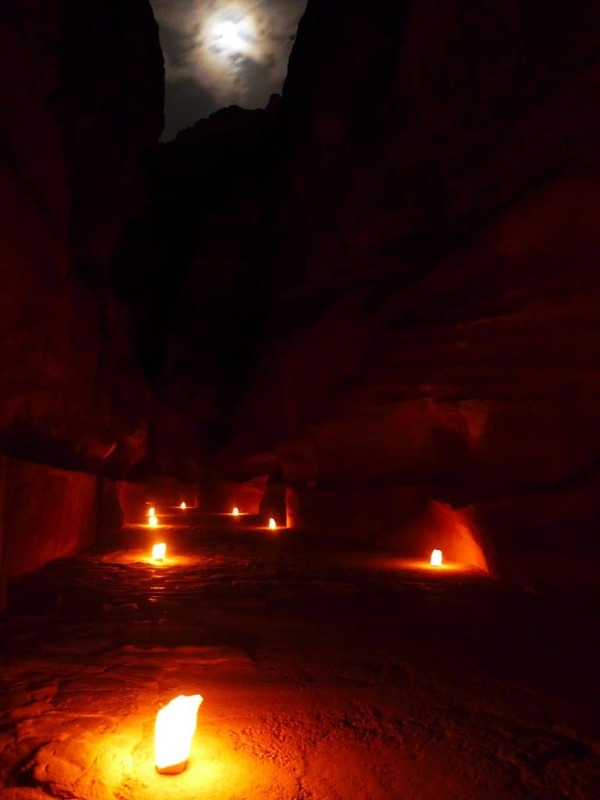 I came back for Petra by Night on my own, trying to hang back and let everyone go through so I could take long exposure photos of the mystical glowing lights. 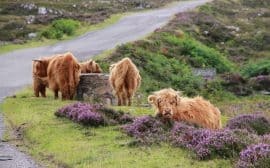 I wasn’t sure whether I’d love it or just find it way too touristy and cheesy…ultimately, I could overlook the crowds and “herding” and found the experience to be really lovely. And I got a couple of pics that I’m super excited by! 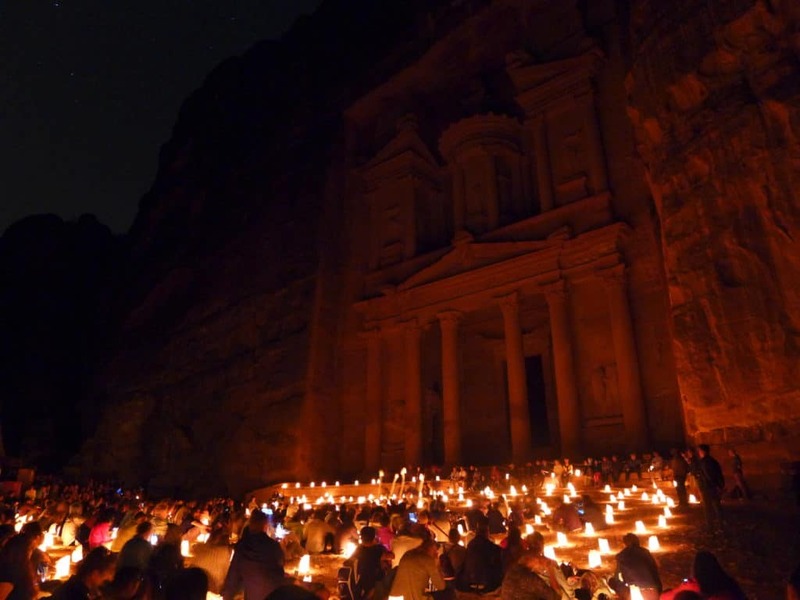 You can see more about the Petra by Night experience in this post. They only offer it three nights a week, so make sure you plan ahead if it’s something you’re wanting to do. 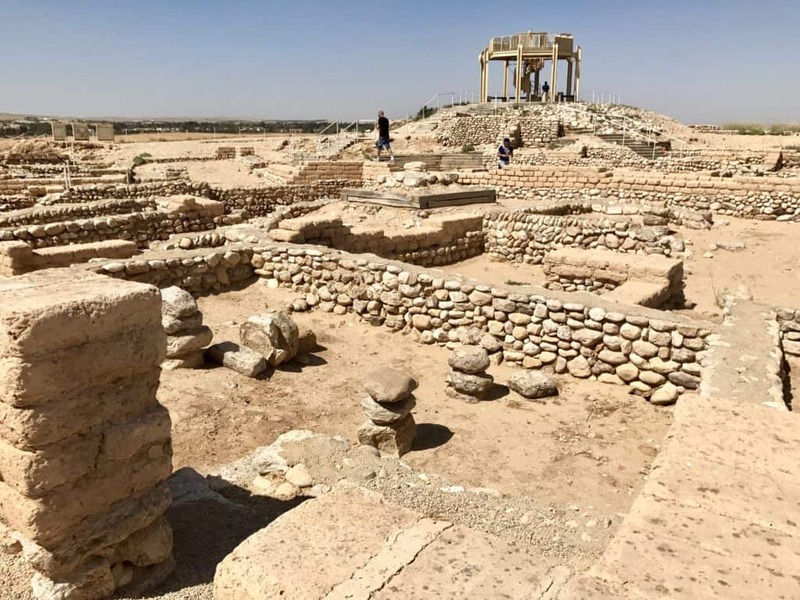 So that ended our two-day jaunt into Jordan. I wish we could have explored this large and fascinating country more, but even with two days we had an amazing time and I would definitely advise someone planning a trip that it can be done and be valuable with only a couple days. You just really have to have your logistics down. To get from Petra back to the Eilat border, a taxi made the most sense vs. trying to take the bus. So we did that and then met back up with Steven and Danielle to head up to Jerusalem. We made it back through security at the border, which took just a bit longer to get through than it had entering Jordan (though still not too bad). Then we spent the day driving back up through the Negev Desert with Jerusalem as our final destination. Steven took a slightly different route so we’d see new landscape. This way took us along the Dead Sea, which was really stark and pretty with the sun on it. 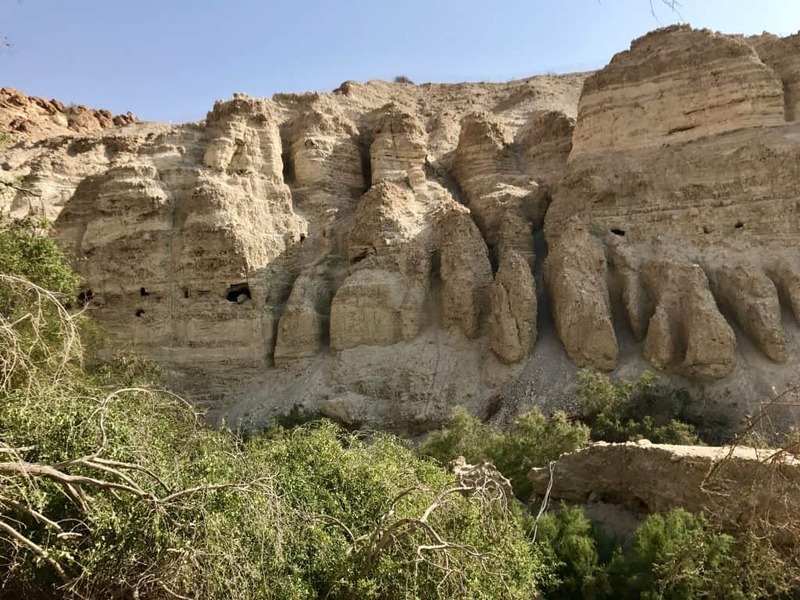 We also stopped at a well-known creamery for some awesome ice cream, and caught a glimpse of the Qumran Caves from the road. 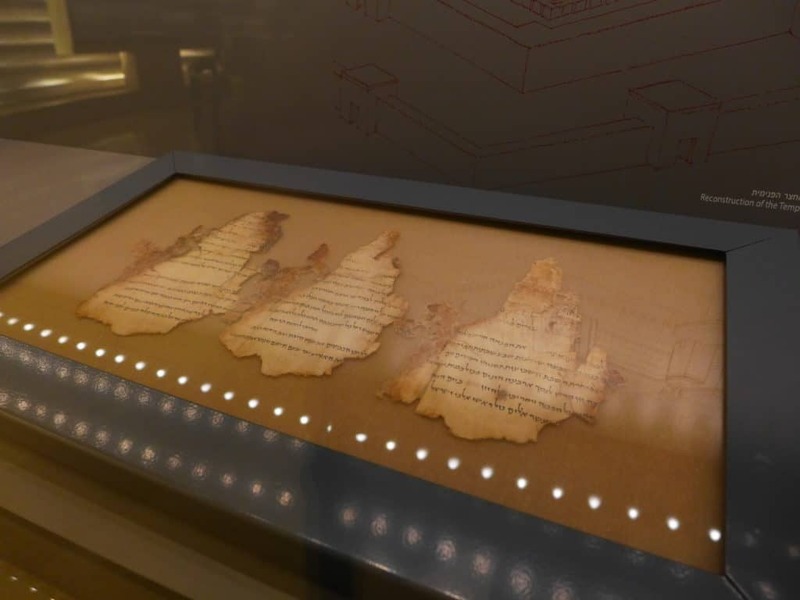 The Qumran Caves are where the Dead Sea Scrolls were discovered, the earliest manuscripts of various biblical texts. I believe you can visit the caves if you want, but we both didn’t have time and it happened to be a national holiday. We arrived in Jerusalem and got checked into our hotel, and then ended up at the Israel Museum right around sunset. I’m definitely NOT a museum person, but it was Independence Day so the museum was free and our friends really wanted to go. I will say that the Israel Museum is massive and really good, and is worth a visit if you’re interested in the history there. 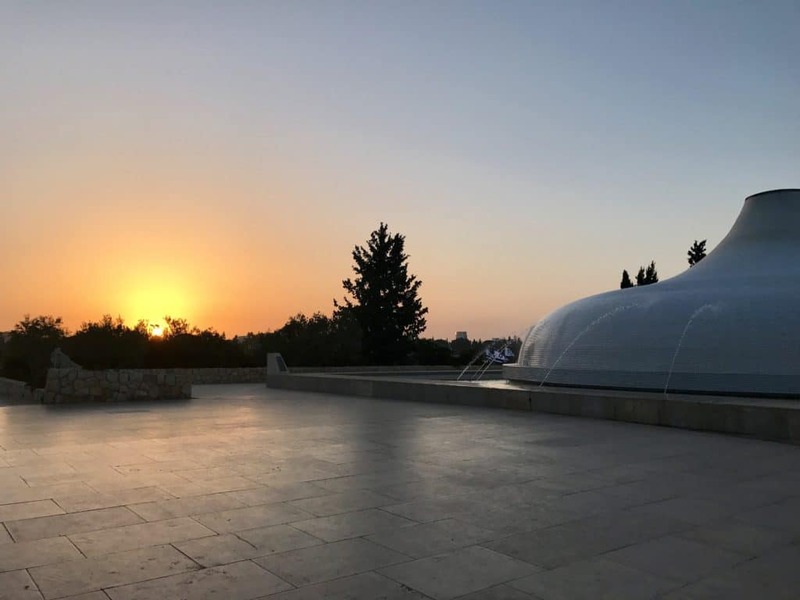 It contains some of the Dead Sea Scrolls as well, and the Shrine of the Book (which contains them, this big white clay pot structure) is really beautiful at sunset. We finished our night at the Shuk, or Mahane Yehuda Market, for dinner. More on that in a minute, because that place is AWESOME. In Jerusalem we based ourselves at the Abraham Hostel (in a private double room), and stayed at the Tel Aviv version as well. It was clean but basic, and offered a good breakfast spread as well as a bar at night. 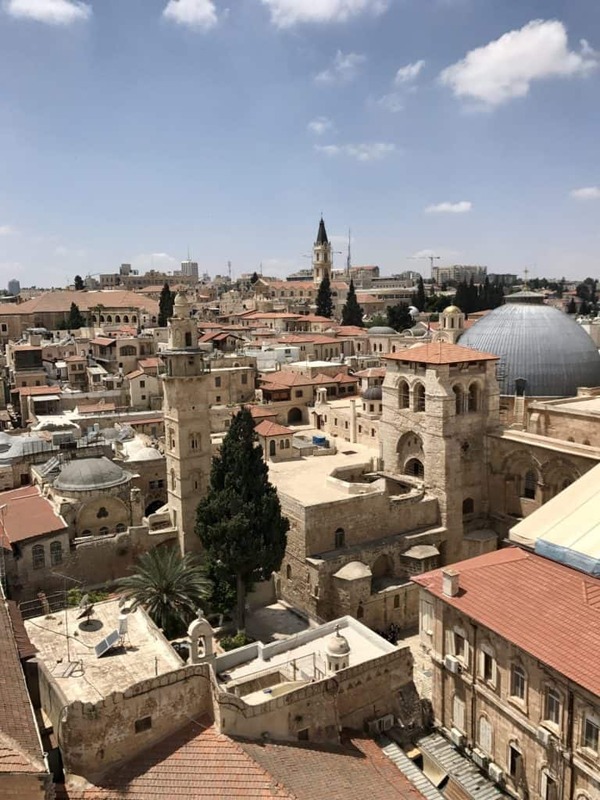 It’s a tall order to make the most of just one day in Jerusalem, given that literally thousands of years of history originate from this one spot. But we got up early, caffeinated, and had a game plan. 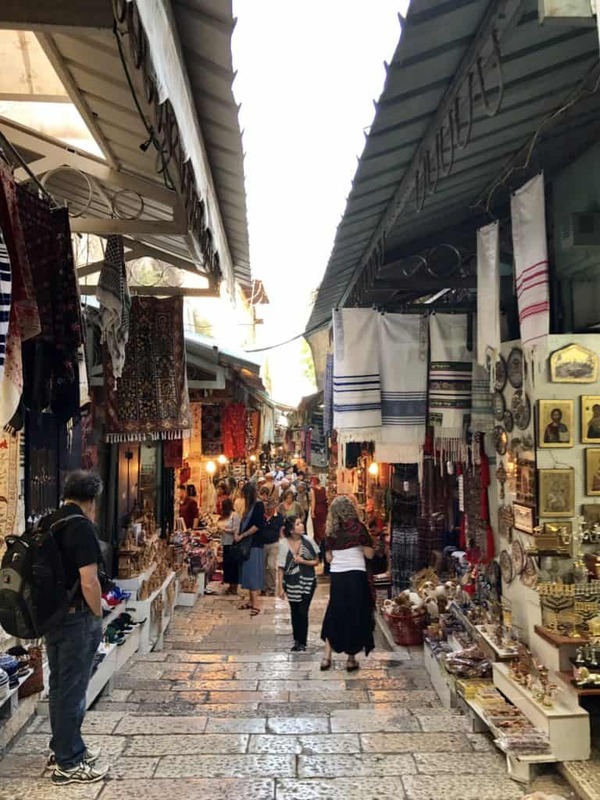 You can read TONS more about our one day in Jerusalem, including the Old City, Temple Mount, Mount of Olives, all the historic gates, and amazing Shuk market here. 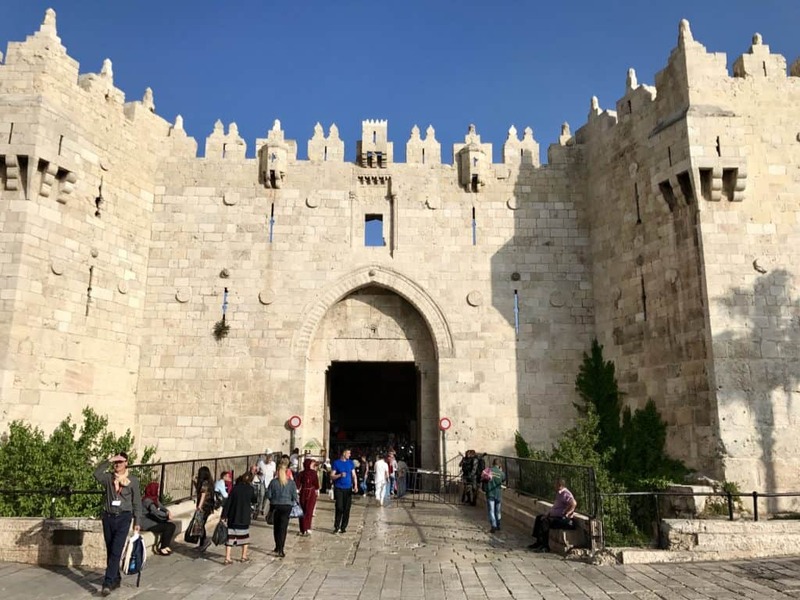 We entered into the Old City through the Jaffa Gate, and overall make sure you visit several of Jerusalem’s historic gates, set inside the old walls. Many of them have really awesome history, both old and newer. Our first stop of the morning was the Temple Mount, which includes the Western Wall (a.k.a. Wailing Wall or Kotel) and the Dome of the Rock. These are two of the most holy sites in Judaism and Islam, respectively, and has made this one little hill hotly contested for centuries. 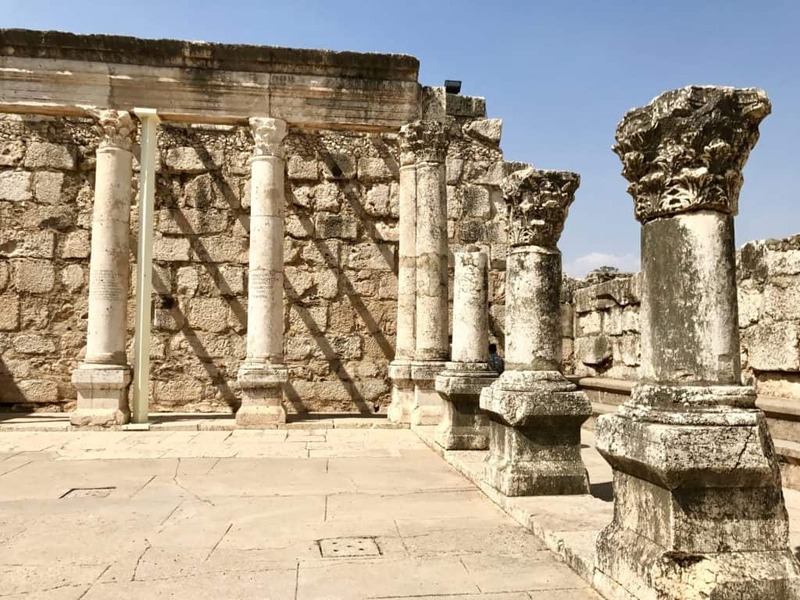 It’s one of the last visible remaining pieces of the Jewish temple that the Romans destroyed in 70 A.D.
We went through security quickly since the lines weren’t long and were able to step up to the famous, sacred wall. However, this varies by day, and if there’s been a security incident it can get shut down at a moment’s notice. 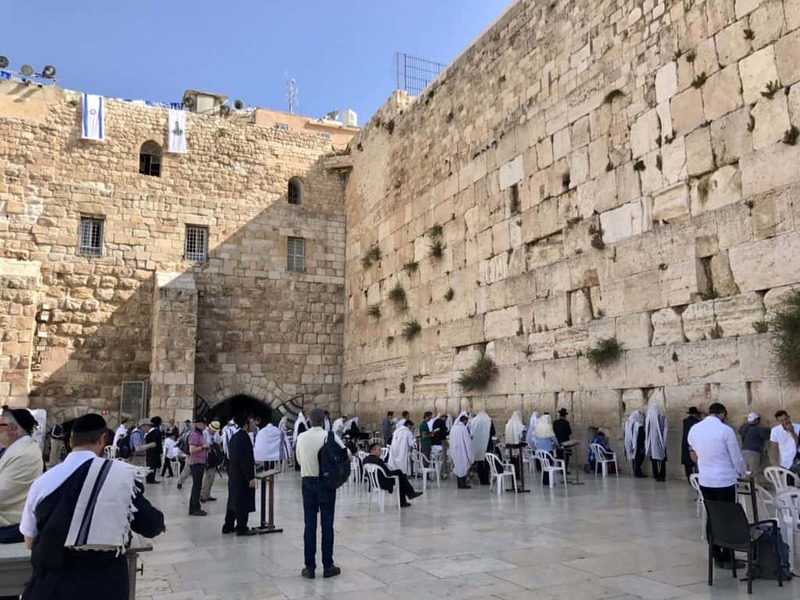 The wall is split by gender, and men will be given a kippah (head covering) if they don’t bring their own, while women’s shoulders and chests must be covered. From the Western Wall we continued over to the Dome of the Rock, which is dazzling. First you’ll see the Al-Aqsa Mosque and the fountain where worshipers can wash themselves. 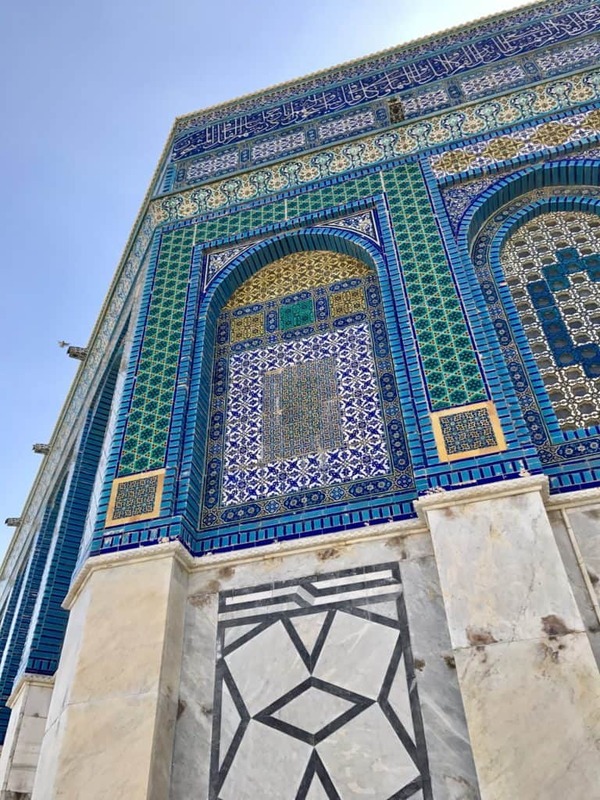 The mosque itself is very plain looking outside next to the Dome of the Rock, and non-Muslims cannot enter. It’s the Dome of the Rock itself that draws the eye on this part of the Temple Mount. The blues, greens, and yellows on the intricately-patterned tiles are so vivid, and the gold-covered dome is super bright on a sunny day. For Muslims, the rock is where Muhammad ascended to heaven, making it the third holiest site for Muslims. For Jews, it is The Foundation Stone (among other things) of the temple and the Holy of Holies, and the holiest site in Judaism. 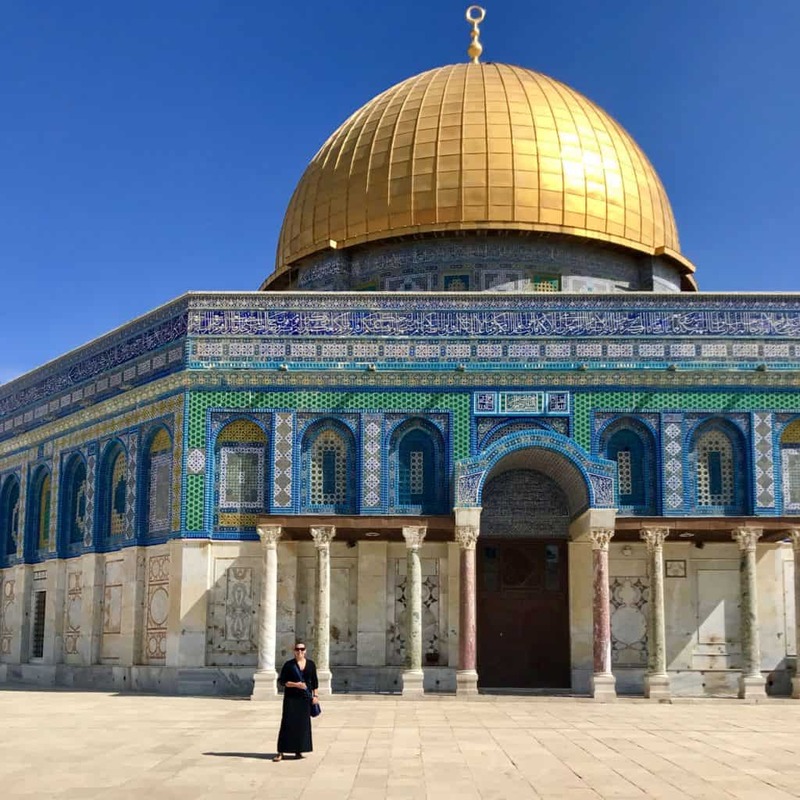 You can read lots more on the background of the Temple Mount and tips for visiting in this post. We left the Temple Mount and then exited the Old City through the Lion’s Gate. From there we easily got a taxi up to the Mount of Olives, which has a dope view of the Old City and Dome of the Rock. 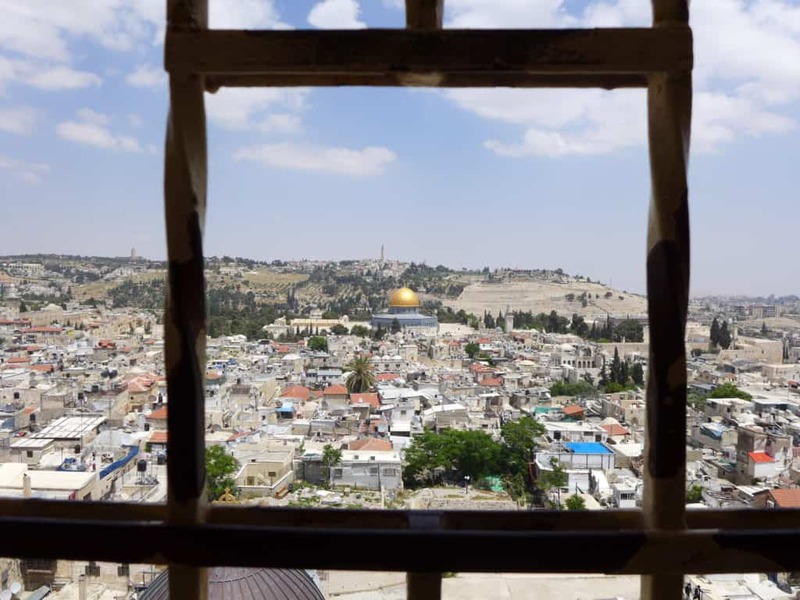 This is the iconic Jerusalem view, and is a can’t-miss. 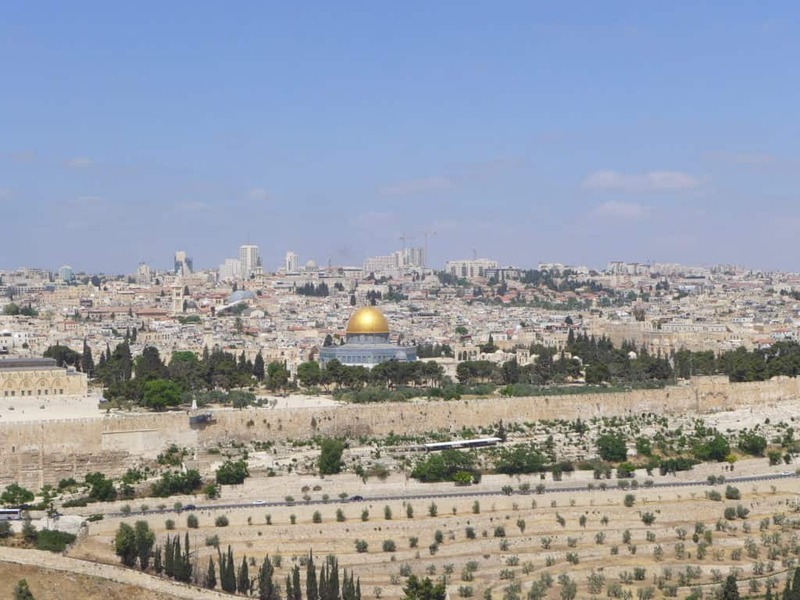 There are a number of sites you can stop at on your way down the Mount of Olives. 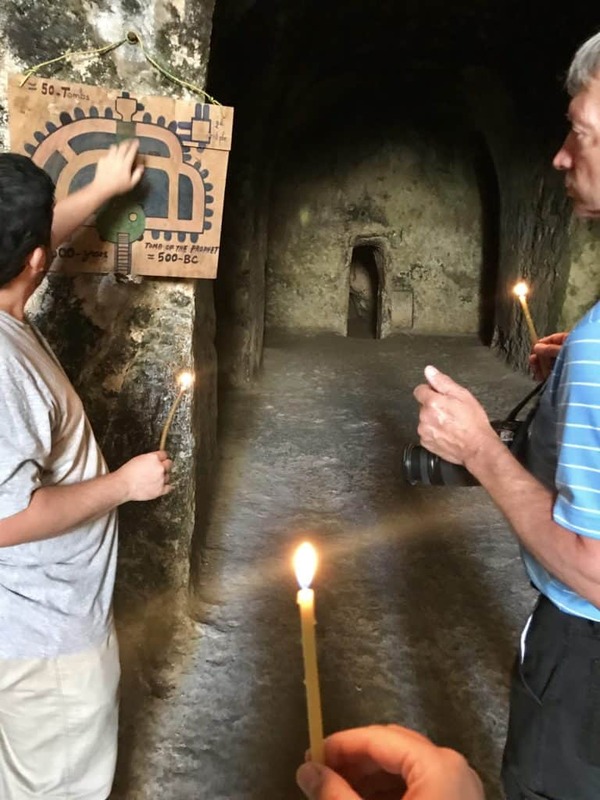 We made a brief stop at the Tomb of Three Prophets, thought to contain the tombs of the 6th-5th century BCE biblical prophets Haggai, Zechariah, and Malachi (as well as some of their followers). And we stopped into the supposed Garden of Gethsemene, where Jesus prayed before His arrest and crucifixion. 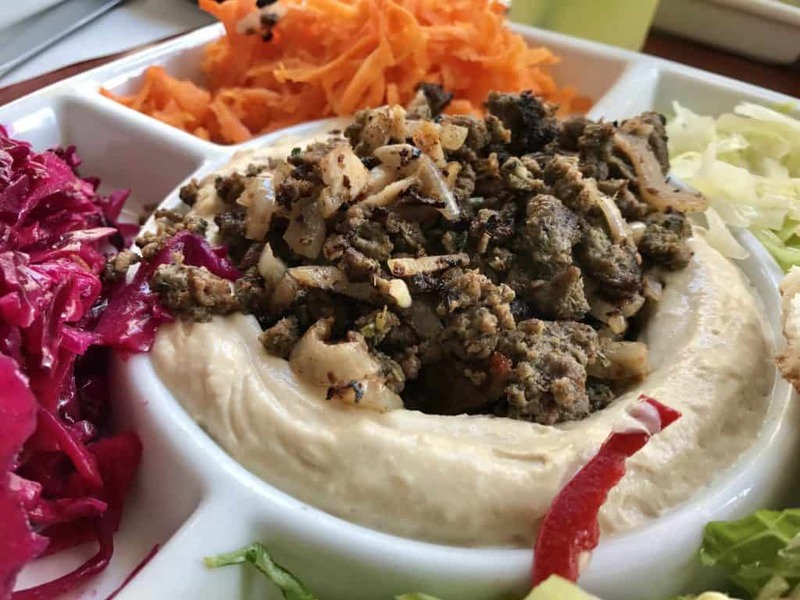 We continued to explore the Old City, stopping for a delicious Palestinian lunch in the Arab Quarter. 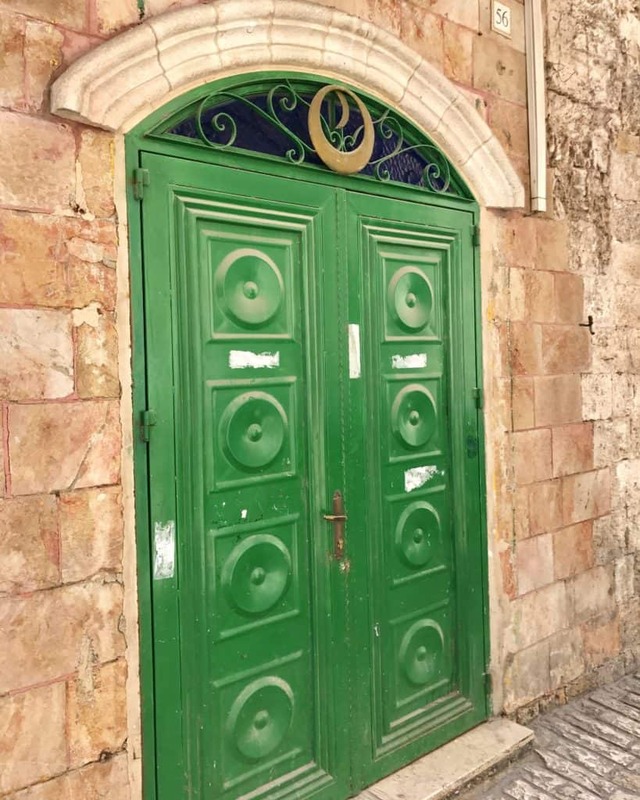 Jerusalem’s Old City is divided into four quarters—Jewish, Christian, Muslim and Armenian. Each has its own ambiance and tons of history, and all of this is crammed into only about 1 square kilometer. Just wandering around is one of the best things you can do. We also stopped by the nearby Church of the Redeemer to climb the tower for a great less-known view of the city. Wandering the narrow streets and alleys of the Old City is special during the heat of the day, when the city is hustling around you. But it’s also super special as the sun sets and the streets quiet, with the shopkeepers closing up for the night and everyone headed home. We went to the Austrian Hospice for a lovely glass of wine with a view, and then wandered the streets a bit more as the light faded. 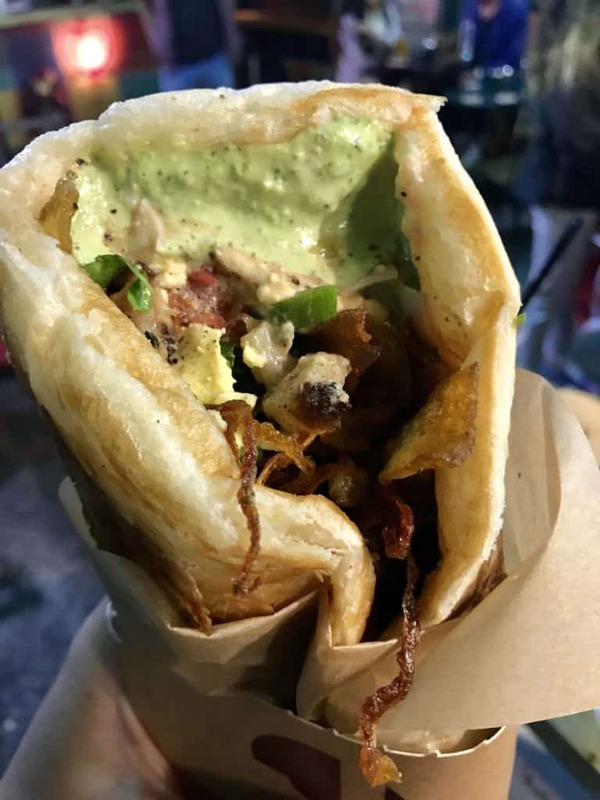 And then we headed back to one of my favorite spots—Mahane Yehuda Market, a.k.a. The Shuk!!! 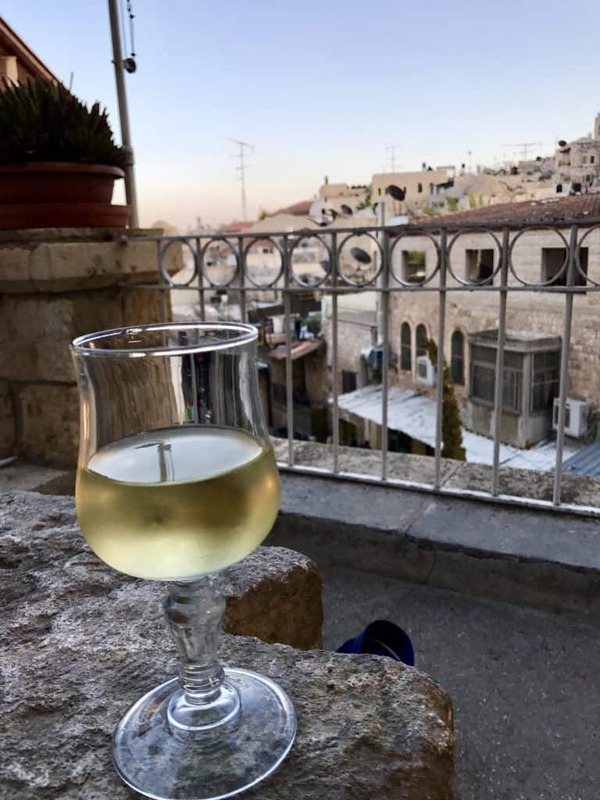 I’ve written a whole post about why I love Mahane Yehuda so much, and in fact I visited three separate times in my less than 48 hours total staying in Jerusalem. 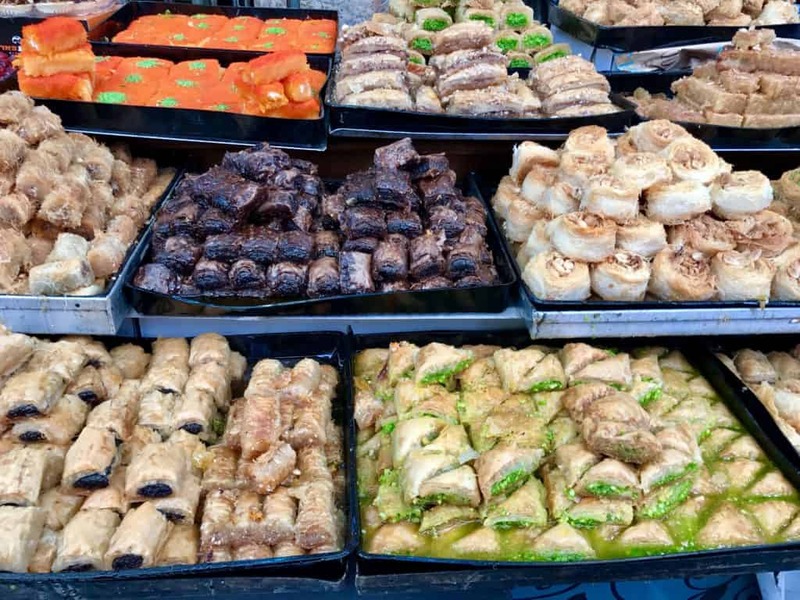 Mahane Yehuda is a huge market, with over 250 stalls that offer everything from fresh falafel to craft beer to fresh produce to these delish pastries. And that’s just during the day! At night the merchants close up shop (with awesome murals on their doors), and it gets even cooler by transforming into a vibrant assortment of bars and restaurants—even DJs spinning. I LOVE THIS PLACE! So as you can see, we really immersed ourselves in Jerusalem despite only having a short time. 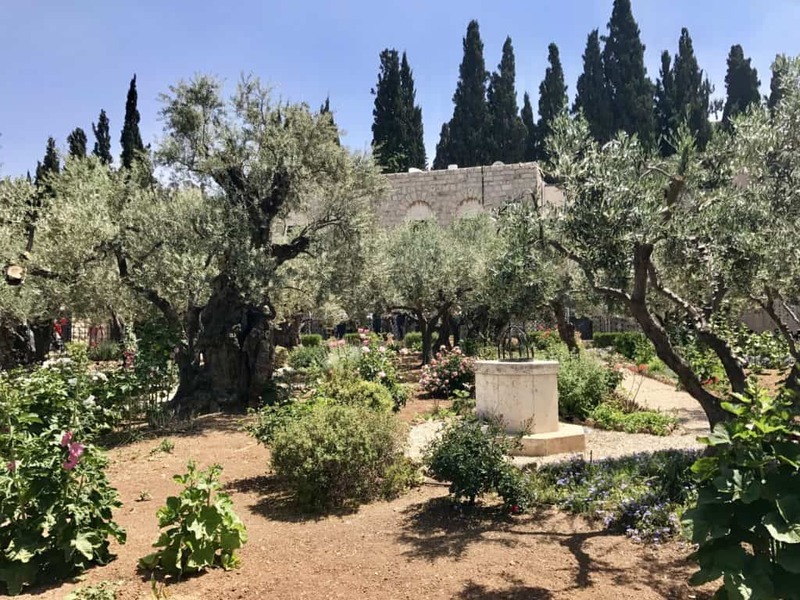 There is obviously so much more you could see or do…if I’d had another afternoon I would have visited Yad Vashem, and I’ve given some other great options in my post on visiting Jerusalem. But since the Old City is so compact you don’t feel cheated on time. Do be aware that the city—especially major chunks of the Old City—really shut down from Friday night at sunset to Saturday night at sunset for the sabbath, and Friday tends to be pretty dead as well as this day is holy both to Muslims and is a sabbath preparation day. Public transportation will be challenging, including to the airport. 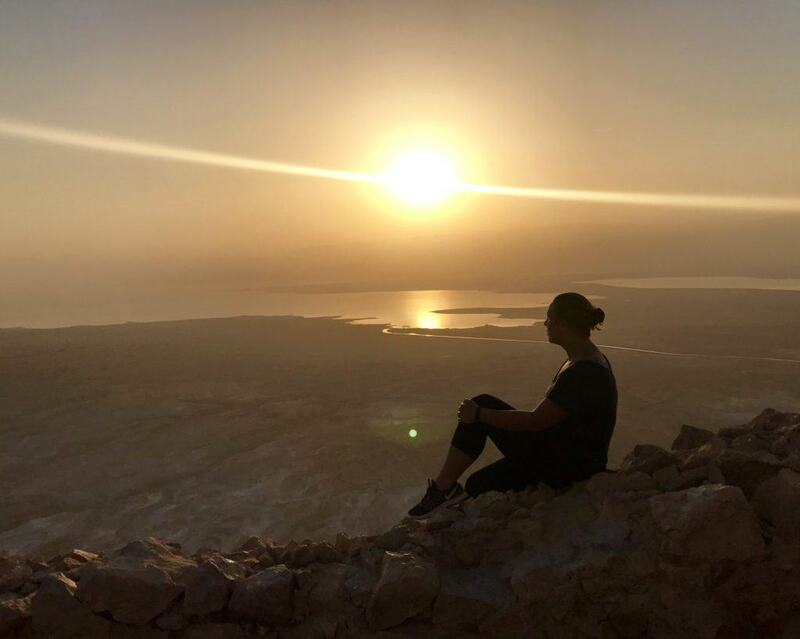 On our last day in Israel, I knew exactly what I wanted to do before leaving—hike up the ancient Masada fortress at sunrise. We had to be up at 2:45am to take a small bus down to the fortress in the dark, and then started up the winding path as the sky began to lighten. Despite the fact that I’d badly twisted my ankle a couple days earlier, I knew I was literally racing the sunrise, so kept up a brisk pace. 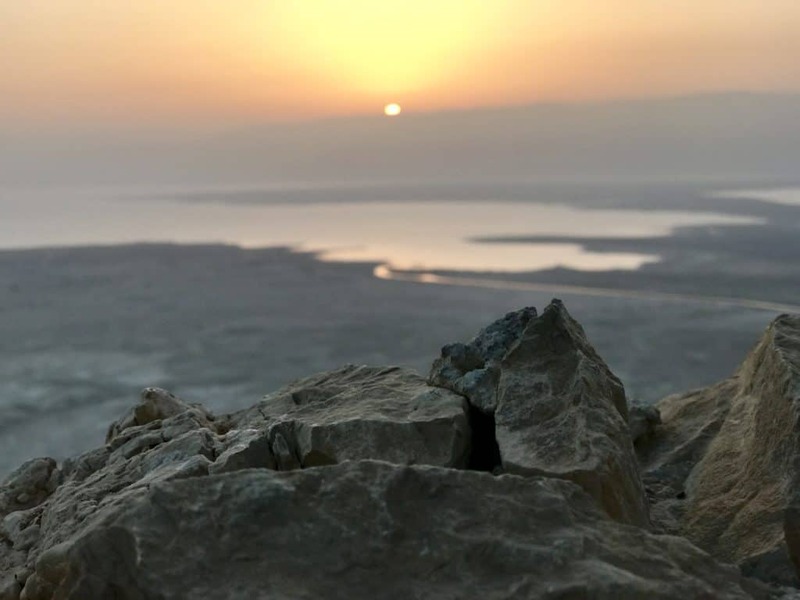 The light kept changing as the sun crept over the horizon, highlighting the salt and mineral deposits from the Dead Sea and glinting off the water. 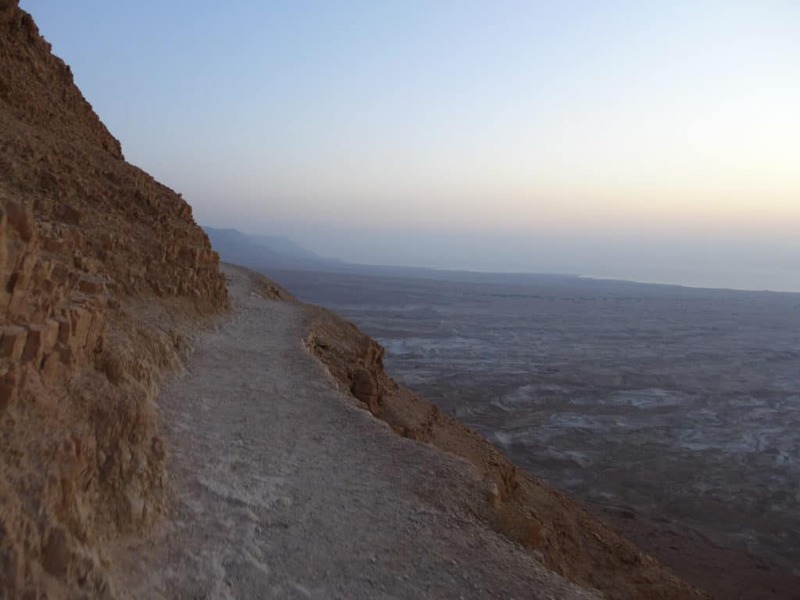 You can read more about why a sunrise hike up Masada should be on your bucket list here. I was gross and sweaty (and starving) when I hit the plateau at the top, but had made it just in time. I grabbed a seat right on the edge of the fortress wall and just…watched. 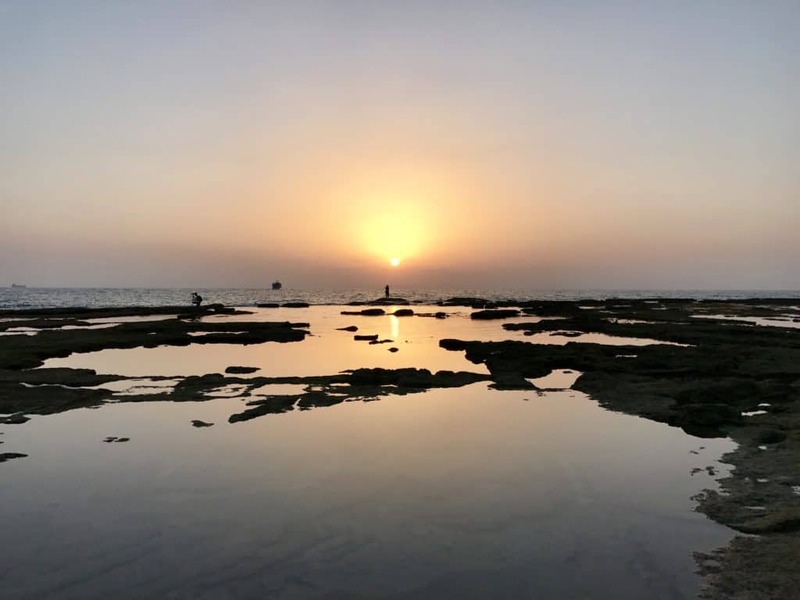 I watched the light change from purples and pinks to oranges and yellows, and as the reflection spread over the Dead Sea. I thought about people thousands of years ago looking at this same view. It’s one of those places and views that feels timeless. Finally, I coaxed myself up and explored a bit of the fortress’s ruins, as well as taking in the surrounding landscape. 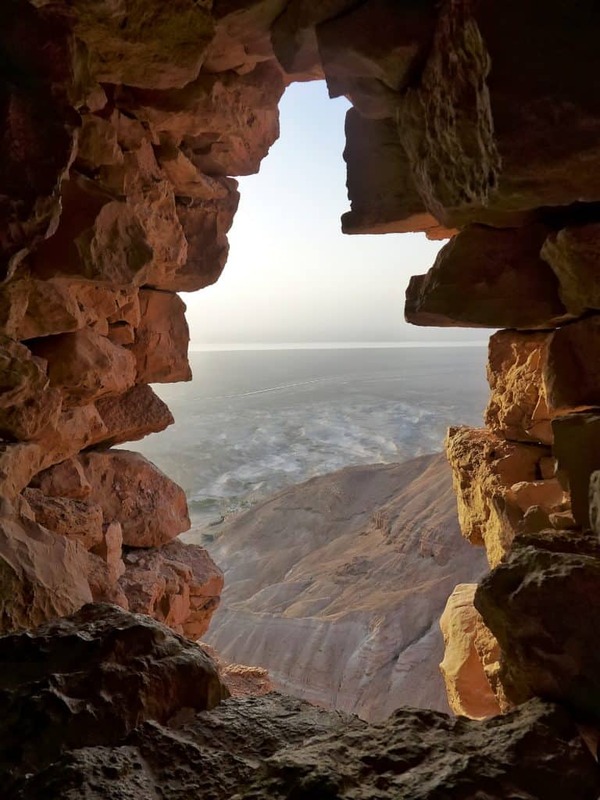 Even if you can’t do the sunrise hike, Masada is still completely worth a visit and has tons of history. It’s very meaningful to the Jewish people, particularly for an event in the 70s AD. Toward the end of the First Jewish-Roman Warm, the Romans besieged the fortress. At the time, almost 1,000 rebels (including families) had taken refuge as a place of last resort. 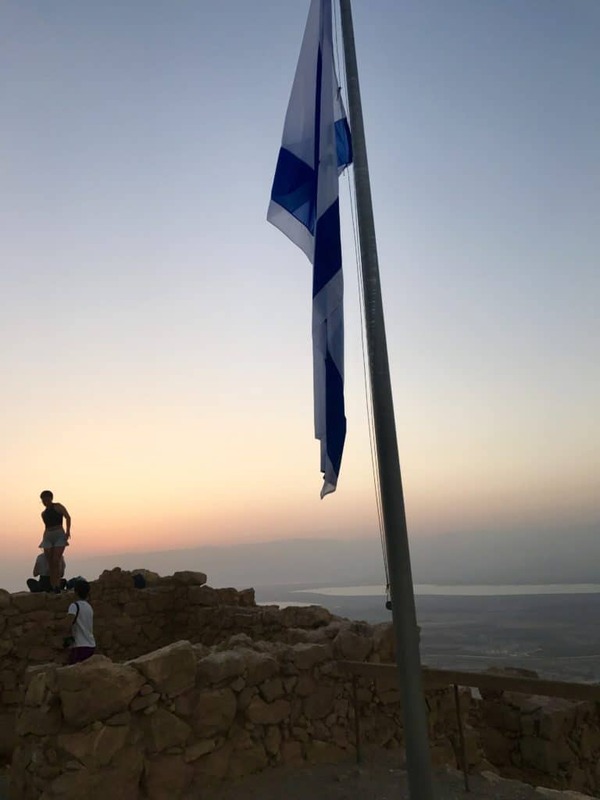 The Romans built a ramp up to the fortress (which still exists) using Jewish slave labor, and the rebels in Masada refused to attack and kill their fellow countrymen, even knowing that it was ultimately dooming themselves. The entire group committed mass suicide rather than be taken prisoner. It is such a sad and powerful story. After getting back to the buses, we headed out for the remainder of our morning tour. 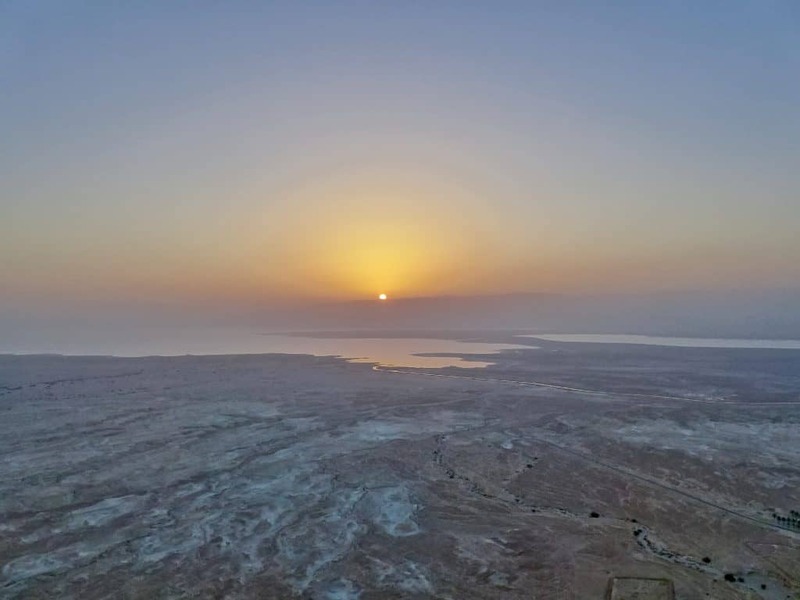 I’ve written more about the pros and cons of this sunrise Masada, En Gedi, and Dead Sea tour in this post. 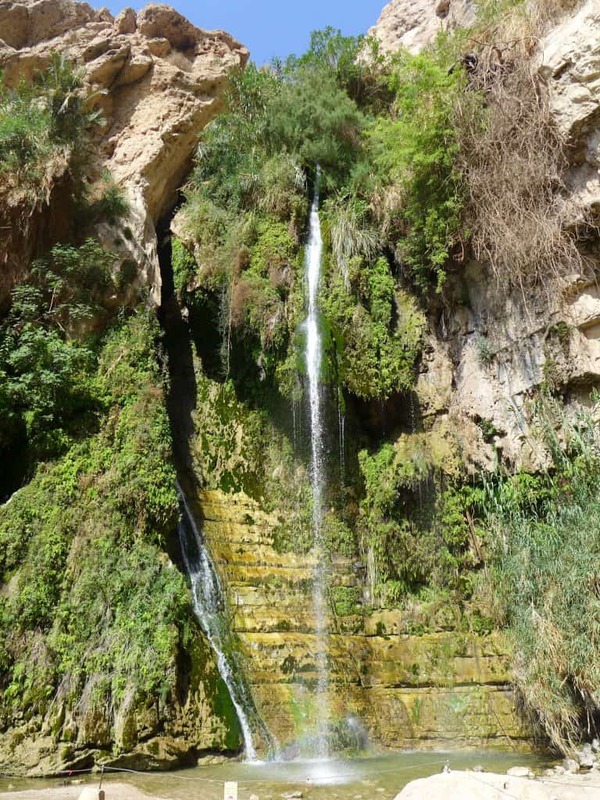 Our next stop was En Gedi. 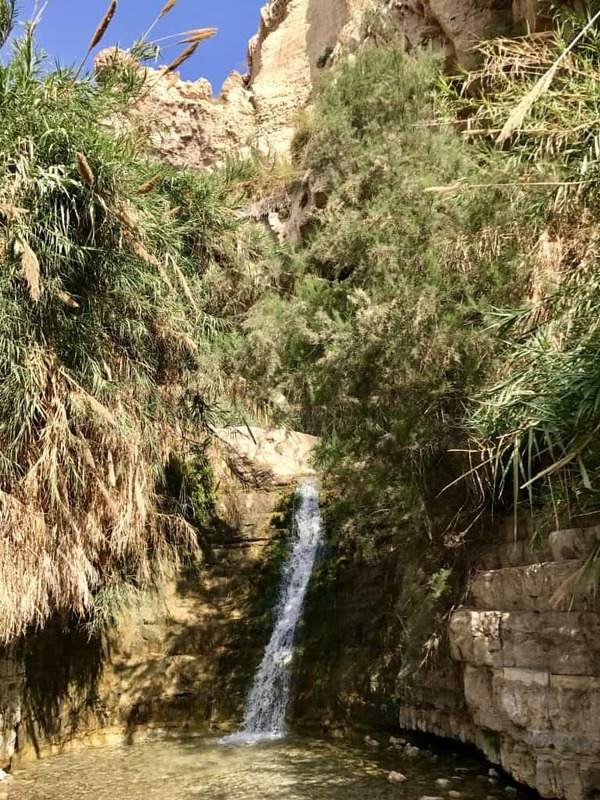 Ein Gedi (or En Gedi) is an oasis and a nature reserve near Masada, the Dead Sea, and Qumrum Caves (if you were looking to group sights together). While it’s a shadow of what it was like a few millennia ago, it still has some greenery and little waterfalls and pools. 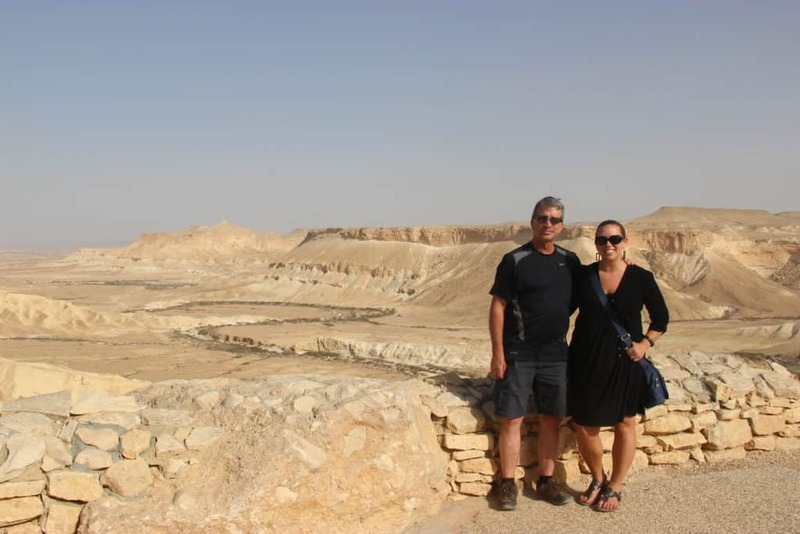 It was a great complement to the beiges and tans of the Negev Desert. 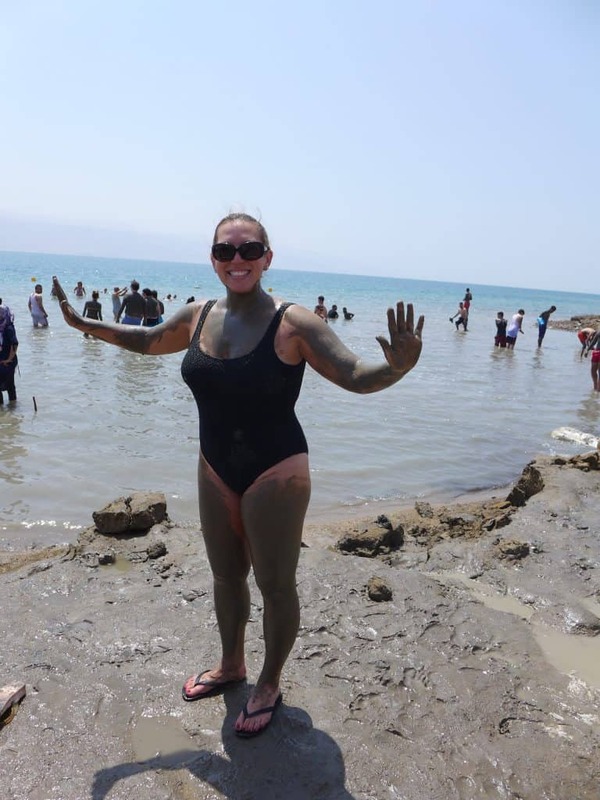 I was pouring sweat at this point since it was crazy hot, but we loaded back into the van and went toward our final stop, the Dead Sea (well, big lake). 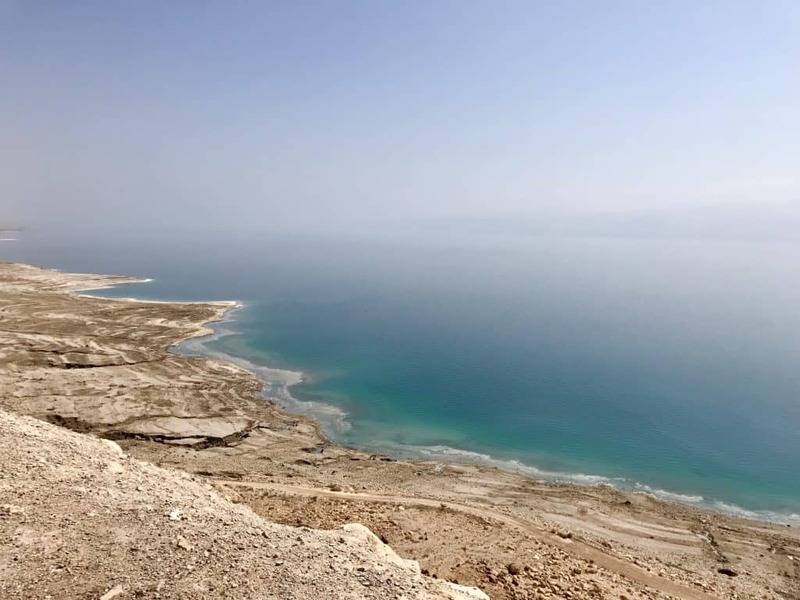 The Dead Sea sits at 400 meters (1,412 feet) below sea level—the lowest point on earth. It’s also the deepest hypersaline lake in the world, a massive 9.6x saltier than the ocean! This gives the water an insane viscosity, and is why you float instead of sink. People come from all over the world to bob around like corks in the water, reading a newspaper or doing the “look, Ma, no hands!” for the cameras. Sooooo that wraps up our epic week in Israel and Jordan! Once we got back to Jerusalem from the tour, I spent a bit more time at Mahane Yehuda and then our flight was at 9pm that night (so we left Jerusalem in late afternoon to ensure we didn’t run into security issues.